So you may already be rolling your eyes just from the title of this post. But, hang in there with me. Every year at this time, I have the same conversation over and over about how I don't really need anything. Many people would admit the same thing. It is a blessing. However, there is one thing that I really do want but cannot really ask for, and it isn't going to happen. We had never really intended for King Diaper to be an only. It is something that I struggle with and am growing to accept. And, in accepting this, I take great joy in our life with him. It is great. And he the part of my life that I was missing and longing for before having him. But, I also think about other children that long just as I do for basic needs. This past year, I learned about a ministry in Uganda that helps children in need. Many of these children have lost their parents tragically and do not have a support system to care of them. 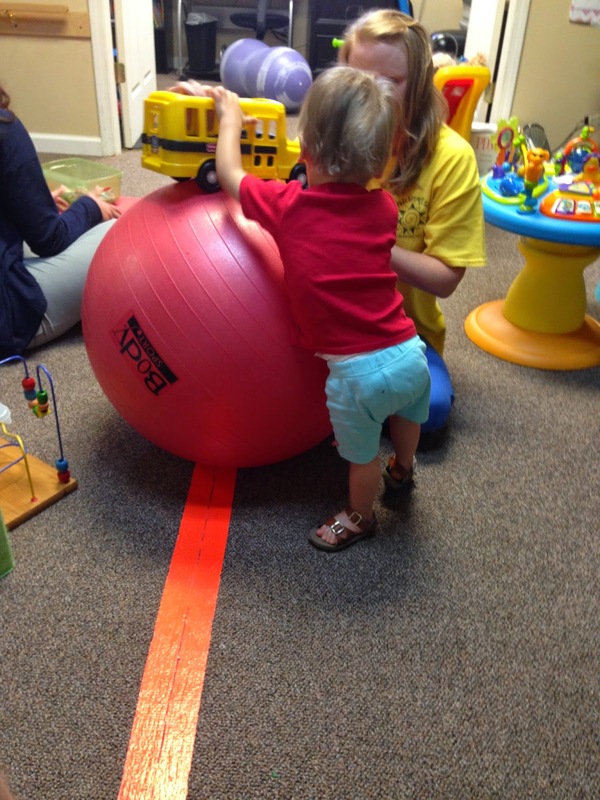 Sonrise Ministries helps to provide a place for both babies and children to grow and thrive. Babies are cared for in a partner ministry called the Sonrise Baby Home. But, this isn't free. And they depend on donors to help support the children they care for. This year, we are going to help sponsor a child there. I like that persons can select a specific child to sponsor/co-sponsor. Persons can read about the child and learn more about the children in need. When I see these children, I think about our own child and the life he has and children his very age in need just like him. Its a connection that I cannot deny and is very real. So, if you are looking for a way to give back and something different to do as you start the new year, consider this as a gift to yourself or for someone you love. And, if you want to help locally, look for a children's home in your area. These facilities help children that are in need. I'm not asking Santa for a little brother or sister for King Diaper. But, I do want to try and help a little child somewhere else to have a better life. To me, it is a gift to be able to help someone else even when I want something I can't have. I love crafting! This Christmas it was time for a wreath update at our house, and this might have been one of the easiest and most enjoyable projects that I have ever done. It required both little time and skill. So, this is a craft for anyone. Decorative items to finish, ornaments or letters, etc! I started with my wire form and started with my first color. You will want to start off with your bold color that you want to stand out the most or is your widest width. You will start by pulling a loop through the form making a puff. This loop with have a tail that is the end of your ribbon where you start and can be tucked in at the end. The other end will be used to continue working around until you are finished. Pull up another loop through another section in the wire form from the longest end of ribbon. Continue doing this all the way around until you have finished your roll. Save the tail to tuck in at the end as you finish off. You will want to space your ribbon so that you can work all the way around with your first color. Next, you will start to do the same thing with your second color. You will space your second color around the first working in and out all the way around your wreath. Finally, doing the same thing with the third color. On the third, you will find that you have less space and need to work a little to pull your pieces into the wreath. This last color should be your accent color to make things pop. You may also use less of this final color. Last, you will attach any accent pieces like your ornaments or monogram letters. This will just depend on your theme and color scheme. Check out the holiday ornament section of your store and pick up things that will work in well and aren't easily broken. You will end up with a fluffy wreath that is easy and pretty. You can pick bright shiny mesh and pair it with simple burlap. Look for colored burlap as well. The main thing is picking things that have enough width and bulk that they will hold their shape as you make your loops. I had a little ribbon left and used it as garland on my tree. This would also make a great gift for someone that you know! This was my little nap time craft over Thanksgiving weekend. And, I'm glad I did it. Get your merry crafting on with a Christmas wreath. Doing a simple craft like this is the best way to be successful with something new and customized just for you! Fear is a feeling that I knew but had never experienced in such big doses until King Diaper. And once you become up close and personal with this emotion on a daily basis, it seems to have a hold on me in a way that I just can't shake. Its real and is connected to something very tangible. Our son. During our time in the NICU, I cannot tell you how many times he was bagged due to breathing difficulties. I have seen him turn shades of grey and blue that make my stomach turn. I've watched nurses and doctors work on him for such a long period that the nurses came back multiple times to give me updates while his little life hung in the balance. 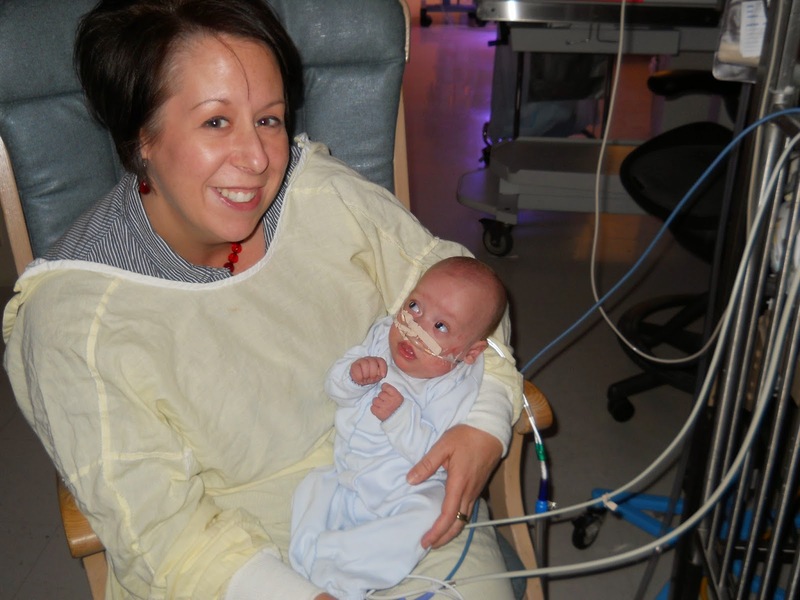 He was the child with one nurse caring for him 24 hours a day while cranked up on the vent and nitric. And yet, now he is at home in our care. For those 6 months, the doctors and nurses were our life line to our child. Every nurse that he had has a story and something real attached. I could probably tell you something about every nurse that helped save his life and bring him home. I will forever be grateful. Even on long frustrating days when I just didn't think I could do it any more, I am still grateful for all that this incredible team of people did. So, why the fear? Well for starters, a cold isn't just a common cold in our house. King Diaper breathes and rattles in ways that would scare most parents at times. It scares me. He coughs to the point of gagging and veins popping out of the sides of his neck as he strains. And in the back of my mind, I can still see that sick little child in his plastic box being bagged by nurses as the alarms went off. Life if a regimented thing for us. There are medicines, and breathing treatments. So days it a cage match to get the mask on his face. He rubs his medicine laced yogurt or applesauce in his hair and screams. And, there are uneventful days. Since Labor Day, we've been battling a cold that isn't getting better. And now, we are onto yet another specialist - a Pediatric Pulmonologist. How is that for a mouthful? I try not to live life in fear. I do enjoy those uneventful days where life is normal and happy and there is little coughing and need for decongestant. But, that two year old boy is still sleeping with an Angel Care monitor during every nap and at night time. When he finally moves to a big boy bed, I don't know if I can let go of that thing. For the first 3 months that we were home, the three of us slept in the guest room with a crib next to us. Every time his monitor would go off, I would jump out of bed waking up next to his bed wondering how I could get up that quickly. Every night as I tip toe to bed, I go in a feel his back just to be sure that he is breathing. Sometimes, I go back in the night. I suppose every parent has fears and worries. Maybe if I asked other parents, it might lessen my worries or make mine seem more normal. I'm not sure. And while the list of doctors is long and the visits are often, I'm thankful. They continue to be my safety net that helps me to navigate through a frightening parenthood. I hope that one day these fears will turn loose. As he grows older, it may make me hold on too tight to a little boy that needs to be normal - running around, getting dirty, playing with bugs and chasing kids on the playground. I can't protect him from everything. But, I can certainly try. 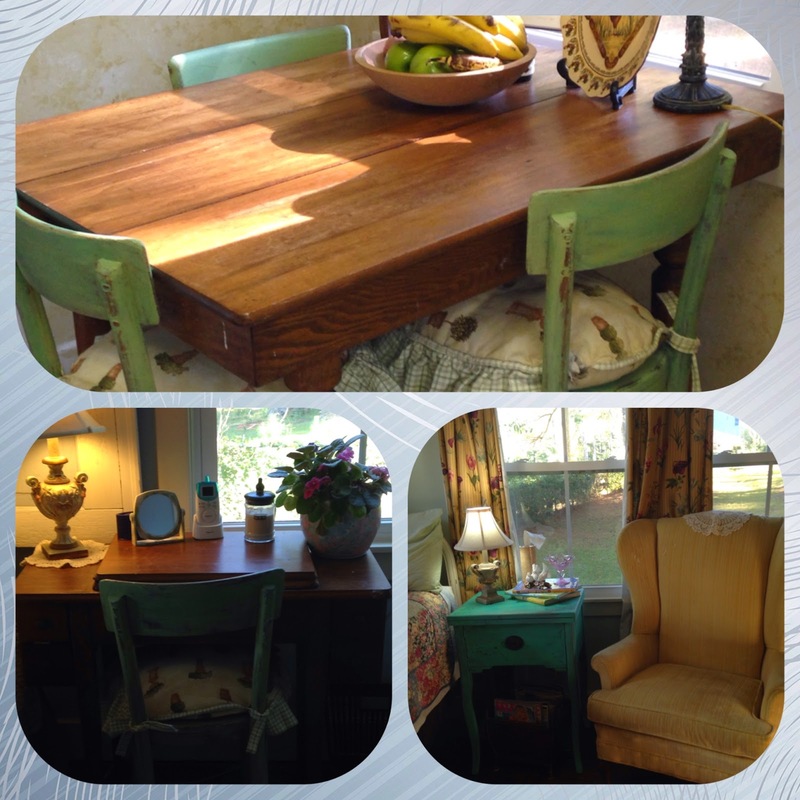 I love crafts, refinishing furniture, sewing, knitting…anything that involves creativity and working with my hands. My dad taught me how to refinish furniture when I was a teenager. Since then, I've tackled on lots of furniture redo's. 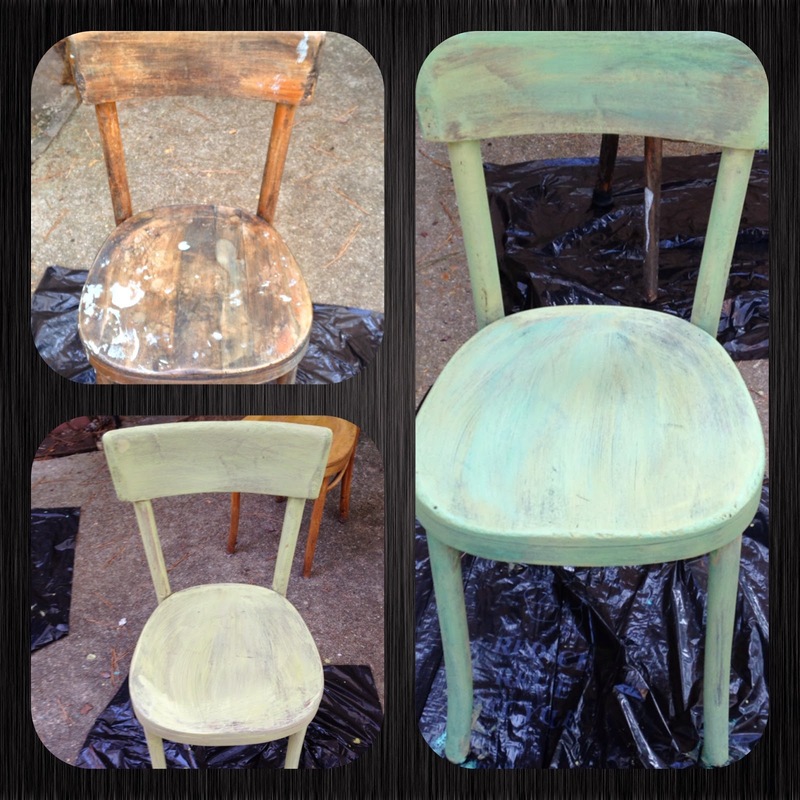 My latest redo has been with Milk Paint. If you start looking around at home stores, you will find lots of retailers that carry either Milk Paint or Chalk Paint. Both of these paints are easy to use and allow one to create a "Shabby Chic" or distressed look on furniture. I prefer distressed. I just can't bring myself to say, "I'm going for the Shabby Chic look." Its just too much! Milk paint can be purchased in powder form and mixed in none other but my favorite mason jars. Yes. These jars can be used for EVERYTHING! The paint needs to be mixed ahead of time and can be mixed to the desired consistency. For these two projects that I recently did, I chose Boho Blue and Apple Green. 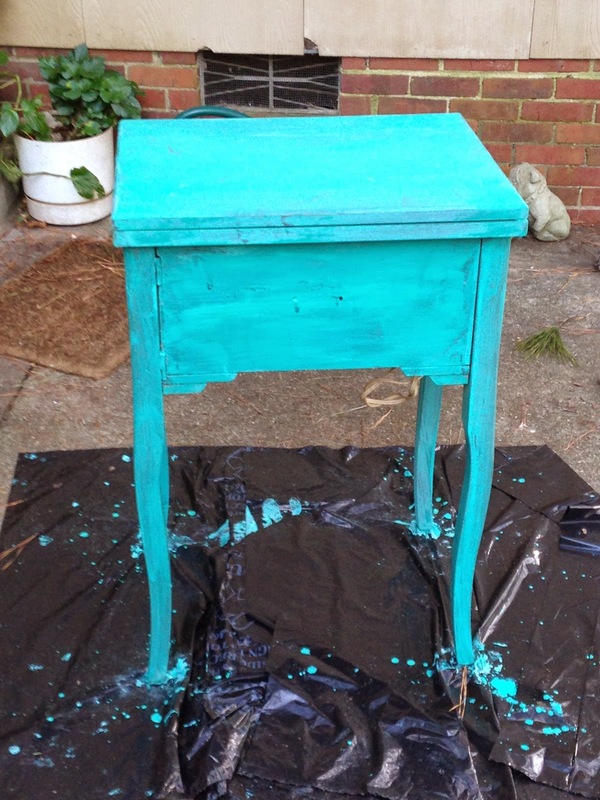 The Boho Blue was for a sewing machine cabinet that we use for a bedroom night stand. The green was to be used with some kitchen chairs. I did the sewing machine table first. I removed the hardware first so that I could paint without ruining the metal on the cabinet. I washed it down with a damp cloth to start with a clean surface. The paint for this project was mixed rather thin because I wanted to be able to see through it in places. When painting, apply as many coats as you like. Layer until you get the look you want. Just pay attention to the brush strokes as they tend to show. After I finished, I let the paint dry overnight. I took a piece of sand paper and removed some of the paint and dusted the surface with a feather duster. Next, a coat of finishing paste was applied. This paste sealed the paint and provided a slightly yellow finish to distress a bit more. For the chairs, I did the same thing. But, I decided that I wanted them green with a bit of the boho blue. Once the green was on, I washed them with a thin smear of the blue. It gave a nice mixed color and turned out great! Both projects were some of the easiest I have done. The four chairs were painted entirely during King Diaper's nap! I finished with paste the next morning. And if you aren't crafty or think you can't do this, you can! Its the kind of project no one can mess it. It isn't supposed to be perfect. The imperfections are what makes the finished project great! So, if you have a piece of furniture that needs a face lift, give it a whirl. Also, if you pass my a junk store on the side of the road with a piece that could find a new home with you, pick it up. This paint is perfect for pieces like this. 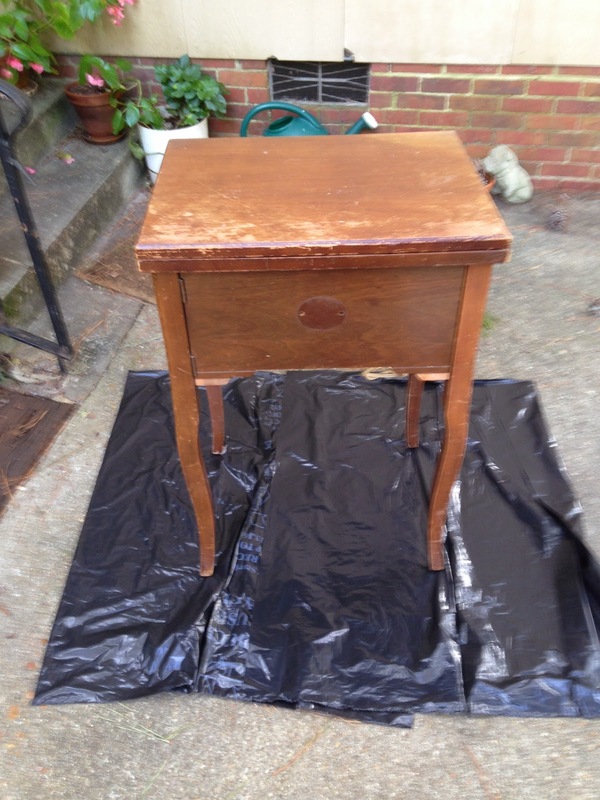 Our sewing machine end table was snatched up for $10! And I love it! Find your inner Martha and get your paint on. Its a relaxing and easy way to get an entire project done in a weekend. And what is more satisfying than that??? King Diaper watching his Baby Einstein at bed time. What I'm about to tell you is part confession and part making sense of something that has bothered me for a long time. I'll preface every word with the fact that we love King Diaper's doctors and nurses more than anyone knows. And, every person that has a sick child in the hospital for months will loose their cookies at some point. Four and a half months into our hospital stay, I am taking what is a rare nap on a Saturday afternoon and receive this phone call, "Mrs. Strahan my nurses are complaining about you..."
1. Our son had been in the hospital since late September. It was now mid February. 2. After having him, I went back to work in two weeks. This was the only normal thing in my life and was a good thing even though it was hard at times. 3. I was working full time every day. I woke up at 5, went to the hospital. After which would get ready and work until 5. Come back to the hospital. Eat dinner during shift change. Change clothes and go back to then go to bed and do it all over again. 4. I had been pumping breast milk every three hours around the clock for this entire time while working and spending time at the hospital. 5. Because of stress and lots of other factors I was barely producing enough breast milk to feed him so was now taking a drug that is to help the body produce more milk. Only, the side effects were depression. There were days I cried for hours. Many times to sleep at night. 6. We were trying to help him learn to bottle feed which was not easy. He cried uncontrollably at nearly every feeding. Bottle feeding a baby that had been tube fed for so long is hard. It's frustrating to the mom and baby and until he could take 8 bottles a day… there would be no discharge date. He was taking 1 a day. 7. His breast milk was in short and dwindling supply because of the feeding pump being used to feed him during his other 7 feelings wasted a portion of his milk each time due to the pump being primed. By the time I realized how quickly this was happening, 42 ounces were gone. 8. To every nurse that ever took care of him, I said thank to them for taking care of him for that shift either in person or by phone. So back to the phone call and complaining nurses. Yes. I had been upset. Yes. I had complained about the wasted breast milk. Yes. I was upset and most likely had not been pleasant. I know that I had reached a point of being irrational really. And, this is a mother that had slept in her own bed 3 times since September of the previous year. I had not had 8 hours of continuous sleep since before being admitted to the hospital on bed rest. And during that time there had been a laundry list of complications and illness related to his prematurity. I had slept in the waiting room on Christmas Eve with my husband as his life hung in the balance. He had been intubated and extubated numerous times. He was finally off the vent but remained on high flow oxygen. Another stumbling block that would not allow a discharge date. And throw in the infections, withdrawals from the pain meds... I could go on here, but I think you get it. So why couldn't that doctor understand why I was so upset? She had that chart right there in front of her and knew the facts. But, still there I was - on the other end of that phone call. I can remember crying into that phone and trying to explain my side of it, how tired I was, and so on. But at the end of it, what I still remember most from that conversation was "my nurses are complaining about you." I left the Ronald McDonald house that afternoon. I abandoned the idea of a nap and went to work. As much as I wanted to see my son. I didn't feel welcome there. I couldn't face the people I had offended. So I worked. Boppy time and a nap! Yes. I went back. Swallowed my pride and pretended it didn't happen. But even now the memory of it makes me cry and still hurts. My mom reminds me when I am frustrated that they (the doctors or nurses) can't know how you feel or what you are going through. They see so many sick children. They can't think about how you feel. Because caring for a child like King Diaper has lots of complications, I don't always understand the reasoning behind the doctors decisions. And some medical staff communicate it better than others. To a mother with a sick child that has been there for months, the only thing she can control is a few diapers she is able to change, the time she is able to spend with the child, the breast milk she provides, and the bottles that she is prescribed to give him a day. And how she reacts to it all. Admittedly, many mistakes were made on my part during that time. Life is trial and error. I managed to dust off and try to keep the crazy in the closet for most of time we had left there. We were still nearly two months from going home. So, I did have to face the unknown complainers for quite some time after this. And where does a mother go from there when she is dependent on these people for her child's care 24 hours a day? I just wanted what was best for our son. That did not involve a kangaroo pump eating 42 ounces of his breast milk. To a sleep deprived mother that was taking medication to help her produce more breast milk with a side effect of depression, there comes a point of no return. I had reached it. And I had lost my cookies. I don't think at that point I knew how to rationally verbalized my frustration. Today, I could. Then. I could not. And to a mother who was stressed and worried about her child, the cutting words about complaining nurses cut to the core. If my husband thought I had cried before, there was not enough kleenexes in 3 counties for the river that poured after that episode. So now I'll rationally say what I couldn't say then, "I'm exhausted from trying to produce enough breast milk and work full time. The medical staff has encouraged me to breast feed because it is best but the kangaroo pump is wasting some of his milk. 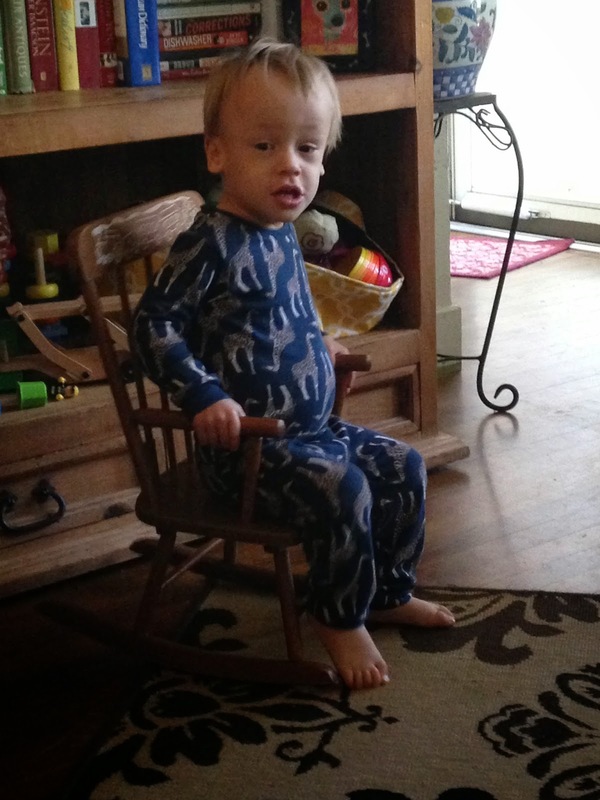 What can we do so this is not so frustrating and so that he gets the nutrition he needs?" And finally, to the nurses I offended, I am sorry. Yes. I said it then and am now saying it again. Publicly this time. I just didn't know what else to do because the only thing I could physically do for our son besides change his diapers and hold him was produce breast milk. He hospitalized for his care 24 hours a day. 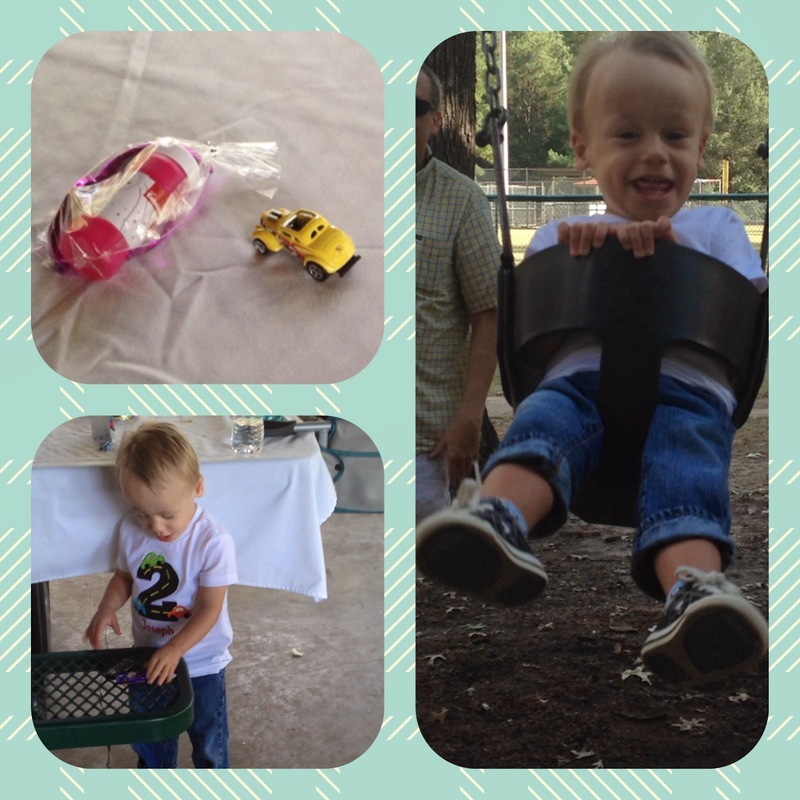 And I so desperately wanted to take care of our son and do what was best for him. Having a team of doctors and nurses care for your child around the clock is difficult and unnatural. I had hoped to have a healthy baby that I would snuggle and take pictures with after delivery. I had an idea of a smiling family and making happy memories. Yet, I gave birth in fear to a tiny baby that came into this world making one tiny kitten like cry to be silenced by a ventilator for the next four months. All the while, I was longing to hold our son and be the mother I had envisioned at the start of my pregnancy. It is easy to get lost in good intentions. The phrase, "the road to hell is paved with good intentions". And I felt like I spent 6 months in hell at the hospital. And some of the good intentions were guarding our sons breast milk like a momma cub and others were those of a frustrated doctor protecting her staff. But at least we are home now. And the complaining I hear now are the grunts and squeals over brushing teeth, washing his face and food he doesn't want to eat. And it doesn't make me cry. We just trudge on into another day. Because I'm not hearing the complaints second had. King Diaper makes them all quite apparent and in real time. I'm sure that doctor had good intentions with her call. She probably felt the need to appease her staff or get to the bottom of an irrational situation with an angry mother. And while her intentions may have been good, they paved a quick road to hell for me sending me into a tailspin as we tried to survive the the last months of that journey. I still see this doctor for visits. And I just smile and discuss the necessary items at appointments. In the year and a half since we came home, I finally feel like myself again. I'm certainly more rational than I was at that point. It is hard to think back to that time in my life and realize how stressed I really was. But, I know it is true. And the remembrance of that phone call anchors that for me. My advice to any mother of a preemie baby that may be reading this…you may in fact reach a point where you loose your cookies. Just remember that it is normal. Try to choose your words carefully and make a point to say when you are frustrated that your frustrations aren't personal. It is about the situation. I tried to do this during our hospital stay. But, between diapers, alarms, shift changes, working, pumping and all the rest of it….sometimes that detail gets lost. And those intentions aren't meant to be hellish….its just the reality of a hellish situation. What's the rush all about? It seems like much of life comes down to a series of moments where I'm saying that I need to hurry up and get home. Or, there is too much traffic, and I'll just go home. Its out of the way. And when I'm home or have been out of town during the week, it makes sense. I just want to go home. But, how many times do we tell ourselves these things when it really doesn't matter? Are we really that busy? And how many times do we cheat ourselves out of doing the simple things we want to do because of our internal clock and schedule? While on the road for work, I try to take advantage of being in different places. I enjoy eating at new and fun restaurants. Pedicures are something that are fun to do after work. If I am done for the day, why not? I don't really have a reason to say no. There is no bath time routine that I'm rushing through dinner for. I'm not prepping lunch or anything else. I spent my weekend doing all of that before I left to go out of town for work. I've earned a minute. 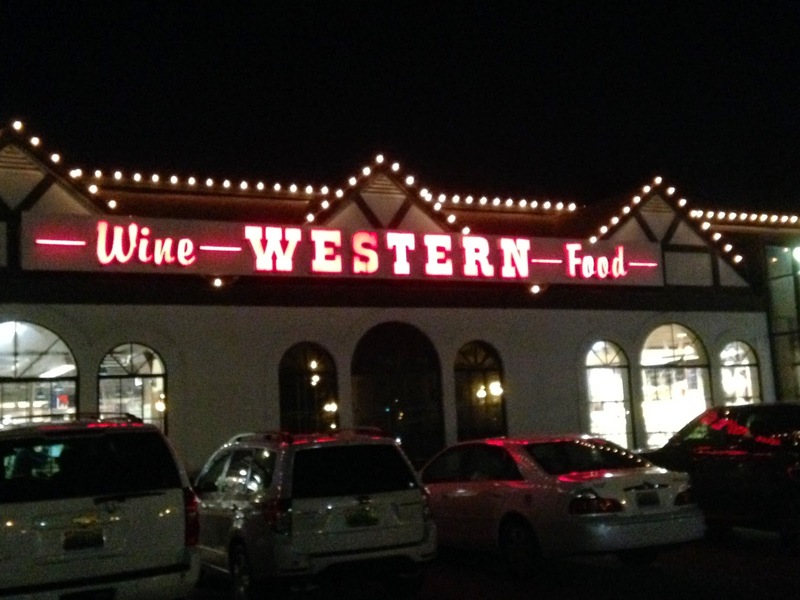 Last week, while in Birmingham, I decided to make a quick trip over to Western Market in Mountain Brook. I could pick up something for dinner and few things to take home. No big deal. I don't have any where to be until 8 in the morning. I'm not talking myself out of this. No matter what! When I finished up that afternoon, it was 5:30. Sigh. If you have never had the pleasure of experiencing 280 in Birmingham during peak hours, it is religious experience. You will either loose ever bit of religion you have. Or, you will be praying with a like you are a tent revival to get you to your destination. Either way, it isn't my idea of ending a day. I trudge on. And only 20 minutes later, I'm there. Pulling into the parking lot and stepping into a meticulously organized store with lots of goodies that are hard to find at home. So, I leisurely shop picking up things like mustard, white worcestershire sauce and a cider we have been anxious to try. (And that my friends have teased me about since.) It doesn't sound like much, but I enjoy cooking. Having fun ingredients makes cooking enjoyable to me. Okay. I don't have to justify this. Not only do I find myself in a perpetual rush, I also feel the need to justify too many things. Just last week, I was justifying an extra sock purchase for King Diaper. I know. Who cares? My mind never stops. That is the biggest part of my problem. After its all over, I have some supper to take back to my hotel and I'm on the road. Back out in the dark evening traffic that suddenly doesn't seem so bad. And I'm glad I didn't talk myself out of this little side trip at the end of my day. Its quiet. My day is done. I'll be able to rest at my hotel. So, I turn up the Christmas music that is playing the first week in November and enjoy my drive. Everyone at home will have some little treats when I get back this week. Its these moments that make me smile and look forward to going back home. And while many times it is the rush of it all, a break is okay. Especially if I am already out of town. Find ways not to talk yourself out of the simple things you want to do. Take a walk. Read part of your book or stop at a place you've been meaning to visit. What's the rush? Much of the time there really isn't one. This is what 2 looks like! November is Prematurity Awareness month. It is something that we are aware of every month. And even though, much of King Diaper's early life is in the rear view mirror, it never goes away. 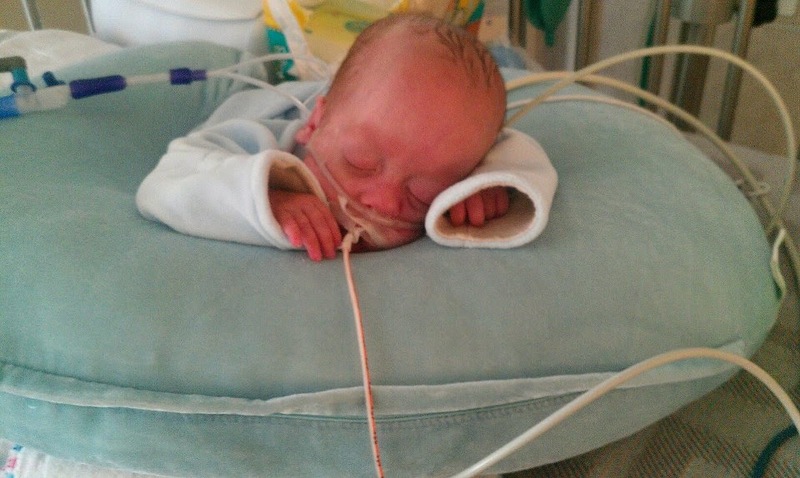 Having a preemie has yielded both horrifying and kind words. I am still amazed at what people feel the need to say to parents with a child in the NICU. We lived through a day to day struggle for a long time before our son was stable and on a path that lead us home. Here are a few gems that may or may not amaze you. 1. "Do they think he is going to be retarded?" Um…no and what if I answered yes. How would that make you feel? Really!? I still cannot get past that one. The question is, are YOU insane for asking that to any parent!? Just this past week, Craig was getting some paperwork filled out for King Diaper. When the lady at the desk found out that he was a preemie born at 25 weeks, she asked, "Does he have Down's Syndrome?" Right there in front of our child! So, it doesn't stop when you come home. And yes, I am taking the paper work back to have a little chat with her. I'm sorry, but my tolerance level for this one failed to exist prior to us becoming parents. I was a public school teacher. One of the things I learned many years ago is that every parent's child(ten) is the best they have. They should be loved unconditionally. 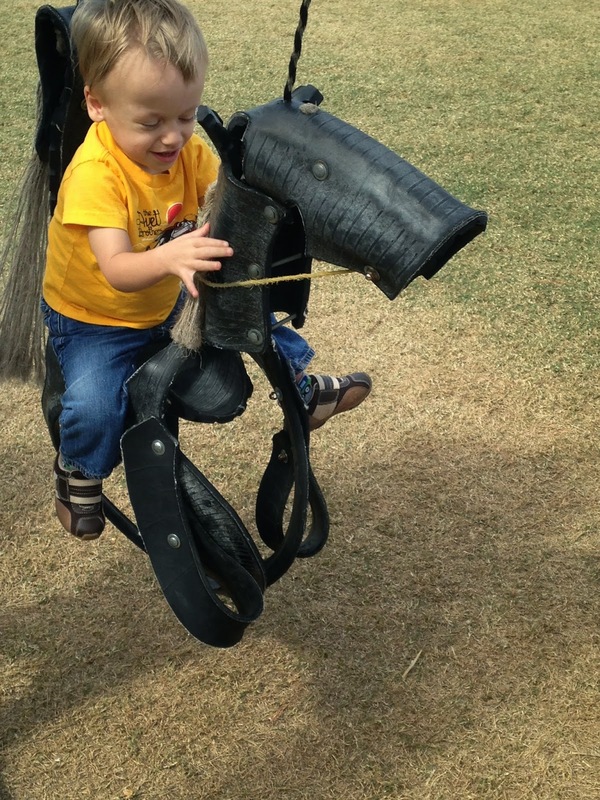 Even if our child had a disability of any kind, he is ours. We would love him, and that is all that matters to any parent. 2. "I know exactly how you feel, my child/children were in the NICU (fill in the blank with any number less than 30 days)." I hate to be the bearer of truly sad news. But, you in fact don't. I could do 30 days in the NICU in my sleep. I had someone this past year say "Yeah, it was hell. We spent 20 whole days in there. How long for you?" 193. I'm not a martyr. But, I'm sorry the difference there is quite vast. I would cry every time that someone we had gotten to know left the Ronald McDonald House. I wanted to go home with our baby. And it seemed to go on forever! Plus we took home our baby. There are many families that aren't that fortunate which is worse than any amount of time we spent in the NICU. So, anyone that goes home is very blessed and should be aptly thankful for that! 3. "He has all his parts!" Wow! Yep. Go figure. 4. "I couldn't hold my baby(ies) for (fill in the blank with any number less than 3 months) and I cried every day." I would have given my right arm to be able to hold our baby. I spent so many days crying at his bedside that I don't want to think about it. It is a true gift to give birth to a baby that you can hold immediately or soon thereafter. I loved my child through a box and on a warmer bed for over three months before he came off the vent. Always remember that if you had a preemie that was not on the vent and could be held, you also were given a huge gift. It is a big deal not to have a child growing in a plastic box hooked up to all of those scary tubes. Thank God every day - even if you are in the NICU. 5. "Your baby isn't walking. Is something wrong with him?" Nope. He just got here 15 weeks early. 7. "Is he on life support?" No comment. 8. "Do they think he will be normal?" Again, the question is, are you normal? Most people aren't. Check out the mirror! And, normal is way overrated! 9. "What does he look like?" A baby. 10. "Do you mind if I ask how old you are? Do you think that is what happened to your baby?" No and no. I'm 40ish and own it. Before you ask, each comment has a real person attached to it. This isn't my passive aggressive way to nudge anyone. I just don't feel the need to humiliate anyone. I think this has been adequately done by the offenders just by making these comments. I won't throw in the endless grandmother comments that go right in there with this. I even had a nurse to ask me if I was our son's grandmother. Sorry. I know that I looked like "who'd of thought it" on many days, but really? That is just going too far! No mother wants to hear that when she has already reached peak weight, has fried hair, no make up and has come to live in yoga pants. That will top your day on a whole new level. Try it out on someone and see how that works out for you. I even had one person tell me how she had seen pictures of a coworker's preemie grandchild and it looked like an alien. This person went on to tell me how people shouldn't show those pictures to anybody. "Its just pitiful." I'm aware of this, but this "pitiful, alien baby" is loved by someone. It happened to be us too with our "pitiful, alien baby". And he is beautiful now and was then. I can remember thinking as this conversation went on, "Do people think our baby looks like an alien?" Oh well. Too bad. Now before you judge me for all of these statements, don't think that I'm for one minute saying that any parent's feelings aren't real. The NICU is a hard place. If you are there for 6 days or 6 months. But, please do remember that if you are a parent that spent minimal time there, the difference is vast for someone that spent a month to every day that you were there. Equally, I remind myself often that no matter how long it seemed to go on, that we brought our baby home. He is healthy and happy and growing. So many families don't bring home their babies. This will forever be worse than one single day that I spent in the NICU. 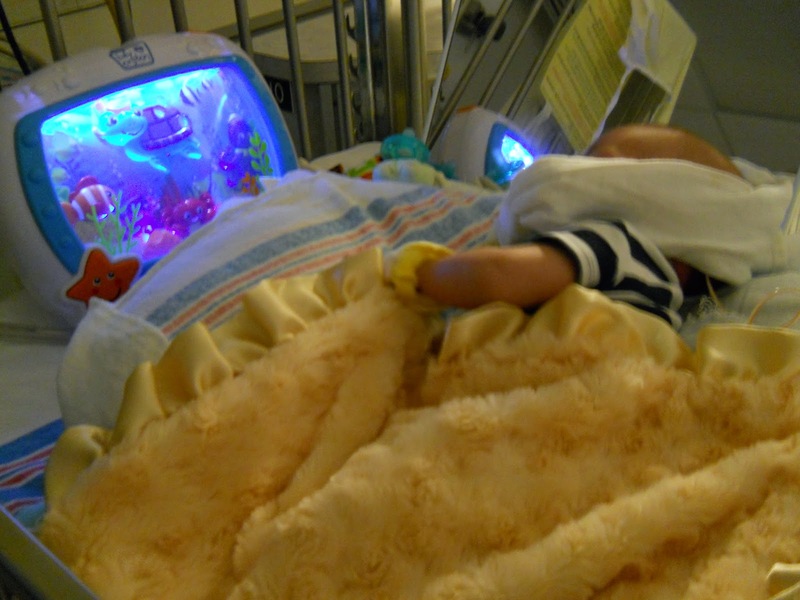 I read about parents now that have spent a year or more in the NICU. So, even I had it easier than others. I had someone say just this month, "Oh I know all about a preemie, my baby was 3 weeks early." I just nodded and said "I know. Its scary." Plus, I know that I have at times and places I have lacked tact and may have stuck my foot in my mouth many times. We have all done and said things we regret. Think before you speak is said to people and quoted repeatedly for a reason. I guess at the end of the day, people don't know what to say. Or they want to "empathize" but it doesn't always come out that way. Sometimes it is better to listen and say nothing. And in our busy lives, what is happening to us is the most important thing. It doesn't always register that someone else may be experiencing something similar or even worse. And for all of those ridiculous things that people have said, I cannot tell you how kind people were and still are. People that I went to college with that reached out to us telling about their experiences and how they made it through. Friends that say things to us now like "Don't worry. He will be fine. My kids didn't….and look at them now." Or the constant reminder that he is a miracle baby and that is the most important thing. The longer that I am home and able to reflect on our experiences and what I learned from them I realize how precious life is. We were given a gift. I don't feel that we can take one minute for granted because it isn't guaranteed or promised to us. Also, choose your words carefully. Everyone out there is going through something whether you know it or not. And while silence is golden at times it is also cruel at others. During that time, I think Craig and I both lived for phone calls, text messages and Facebook interaction with our friends and family since we were so isolated from everything else in this world. Those were the things that added sunshine on many dark days. 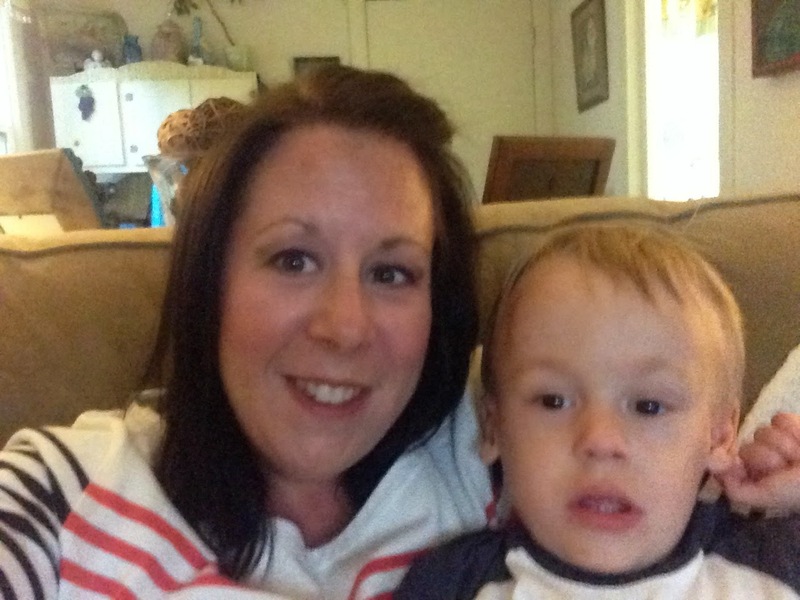 Mommy and her little guy! We had friends that reached out to us in so many different ways and we were two hours from home. Lives go on and our world was stopped for a long time. But through it all, we had people to come by to visit us, sit with us through heart surgery and just for an afternoon coffee break. There were friends that came and spent the night to hang out and visit. Other invited us into their homes during the holidays. These are all memories that I remember and smile because it is what helped us to make it through. Our friends and family mean more to us now than at any time in our life. Going through a crisis tends to make that happen. Sometimes, we tend to move away from those series of events and begin to forget the important things. I hope that no matter how much time passes or how old King Diaper is, that I never forget that lesson. Because that is what matters most and trumps the list of crazy that we encounter. 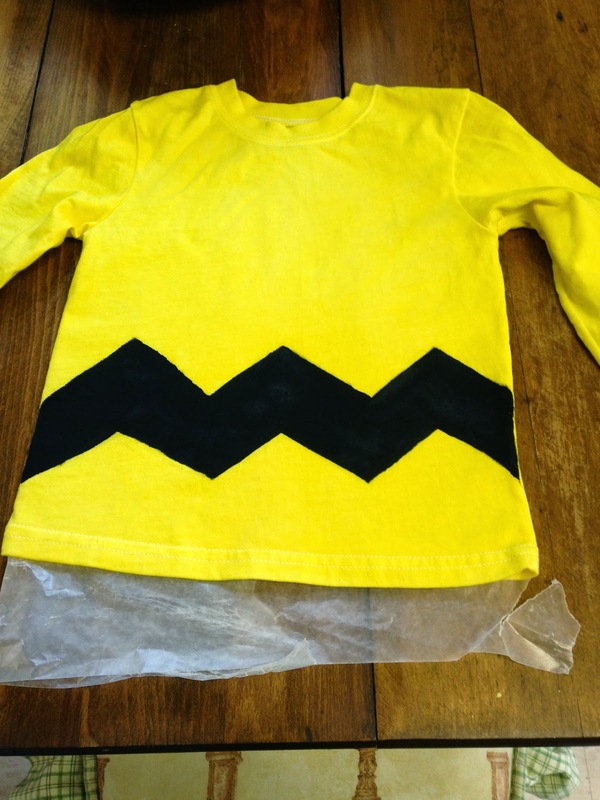 King Diaper's Charlie Brown Shirt! Halloween is tomorrow, and we are ready at our house. Until this year, we have celebrated Halloween going to grown up parties. I've been Little Red Riding Hood, a Catholic School girl and all the other fun costumes that grown up women like to do. And, I've finally traded some of that for something more elementary and quite different. King Diaper is going to trick or treat for his first time this year, and I'm excited not to have to do a costume for myself actually. I started out looking at all of the store bought costumes and didn't find much of it to be for us. So, I went to my "go-to" ideas places - Etsy and Pinterest. And there it was! Charlie Brown! Both easy and fun. Since we already have a stuffed Snoopy, all we needed was the yellow shirt with black zig zag. I could have bought one, but I knew I could make it cheaper and pretty quick. I started with a plain, long sleeve, white tee shirt. Why not yellow? Not any easy find! But, I could just dye it. No big deal. 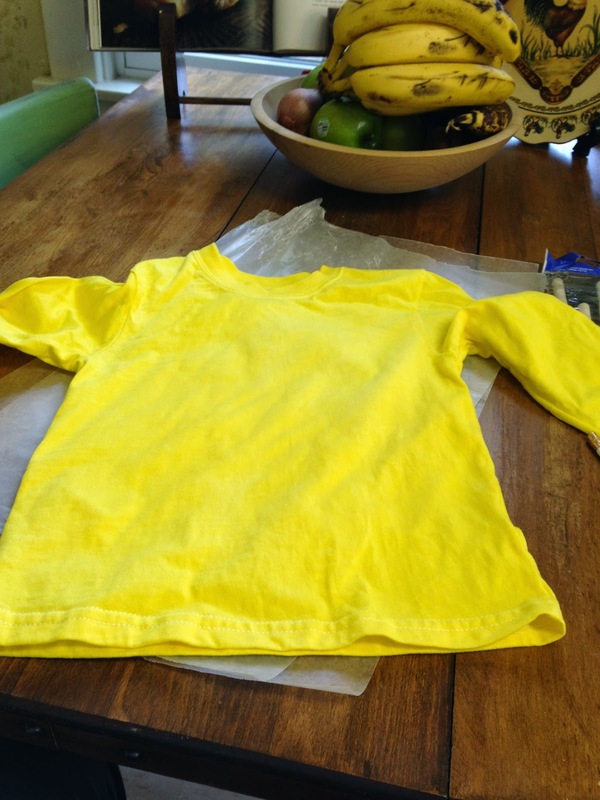 I picked up a bottle of yellow liquid fabric dye and did it in about 30 minutes. Its not the kind of thing one has to watch over. Once the time was up, I just stuffed it into the washer and did a quick wash.
Next I drew off a zig zag with a pencil onto the bottom of the shirt and painted it with black paint and a foam brush. The paint was just a simple craft paint. The foam brush was helpful in straightening the edge of the lines. When doing something like this, but a piece of paper or cardboard between the layers to keep it from bleeding through. You could also draw the black zig zag outline with a permanent marker and paint inside the line. Either way, its so easy. The grand total was $8.89 for the whole lot of items. Or, $7.79 if you are looking at the exact total of the items used. Either way, it was less than $10 for everything! 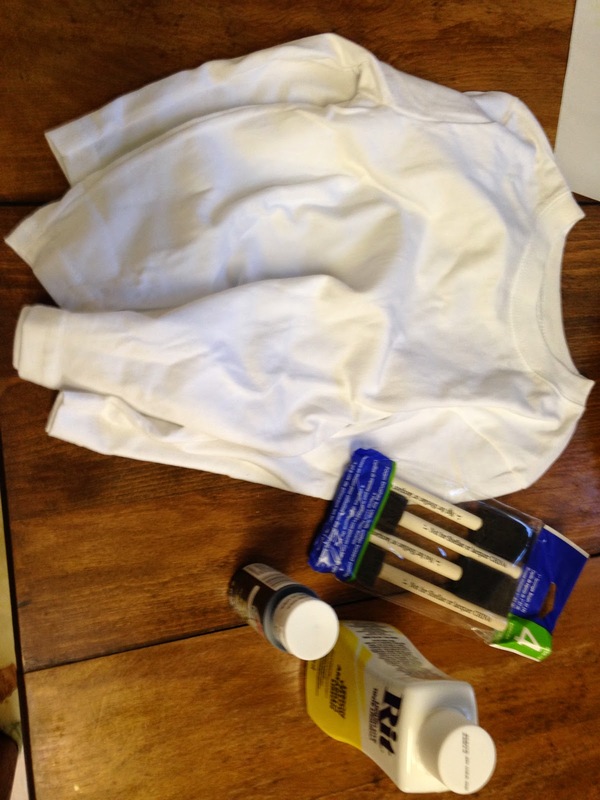 Shirt after dying and ready for paint! Halloween night, he will wear the shirt and jeans with his Chuck Taylors. Our "Charlie Brown" will have Snoopy and a plastic pumpkin. And for purest, this is our version of Charlie Brown. Part of the fun of Halloween isn't recreating the exact replica as much as creating our own costume through one's own eyes. So look for some inspiration on Pinterest or Etsy. A simple search for children's costumes or something more specific (gender or theme) will yield some great results. And if you don't have time to make your own, Etsy probably has a vendor that can do the work for you. Yes. I know Halloween is tomorrow. But, it is never to early to start thinking about next year. So, Happy Halloween! Enjoy whatever festivities you plan to join in on whether it be handing out candies, taking little ones trick or treating and dressing up yourself. You are never to old to enjoy this holiday. I'm excited to see it through a child's eyes this year! is a nice seasonal touch of color! For King Diaper's Birthday this year, we had a car themed birthday party. It was lots of fun to plan and lots less complicated. I think that one of the best ways to plan an event or party is with a Pinterest Board. I started my Car Themed Birthday Party Board several months ago with collected ideas. 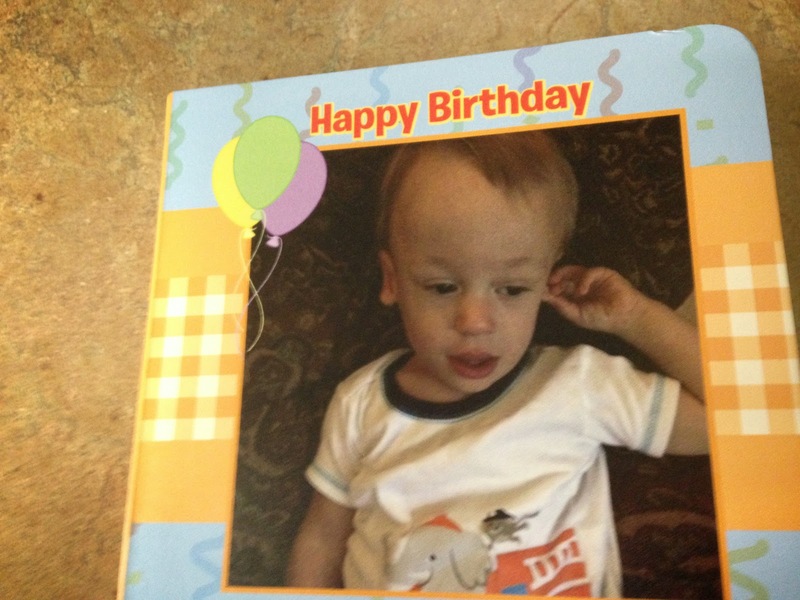 Ordered a car theme party invitation from Tiny Prints. I also ordered bright solid color plates, napkins and cups in yellow, red, orange and green. 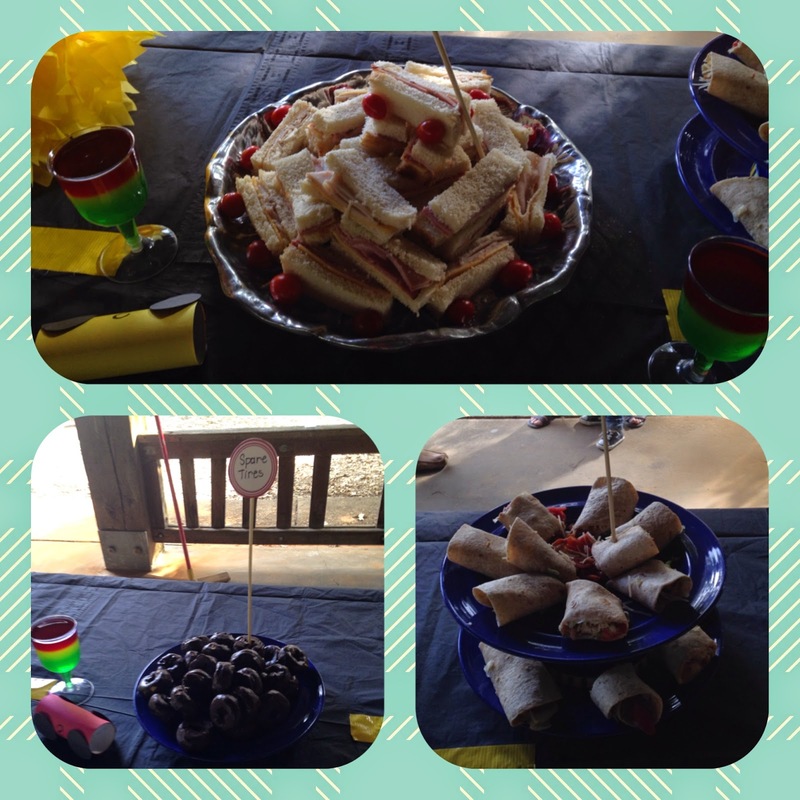 I used black table cloths on the tables with yellow tape making a road stripe down the middle. Toilet paper holders were turned into small cars along the table. All of these things were easy and could be done in advance. 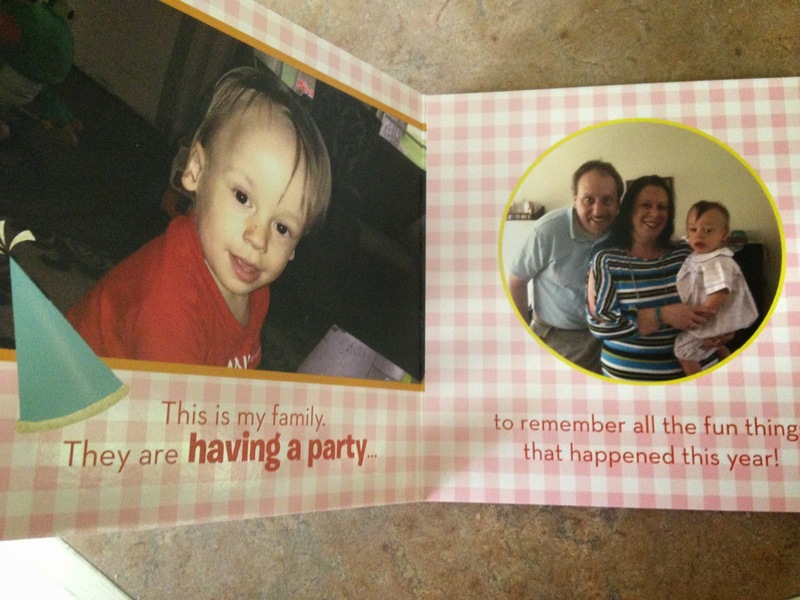 Also, party invitations could easily be made through a print or word processing program. These things were all done first. Food was yet another easy fix. Spare tires - chocolate covered doughnuts. Stop light cups - Jello layered into little plastic wine cups in green, yellow and red. Kids really liked this. I hadn't had jello in years! Turkey and ham sandwiches race cars - I cut the sandwiches into narrow thirds and attached 4 little grape tomatoes with toothpicks for wheels. Cup cakes - Plain with sprinkles and little cut out toppers that I found a print out for with the theme online for free. I even printed labels for the food from a free site. The final thing was a birthday shirt for the birthday boy. I love Etsy! It is an addiction. But there are so many wonderful gifts and unique items from lots of different sellers! 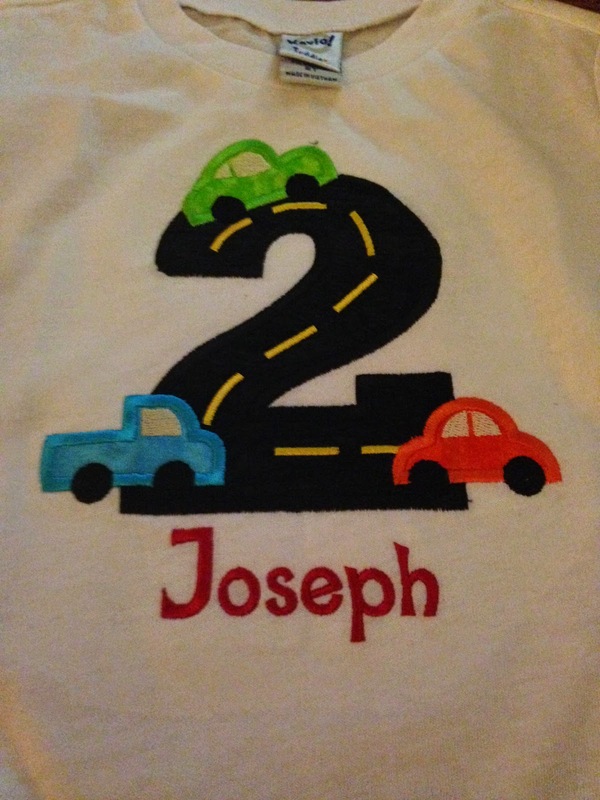 I picked out a shirt with the number 2 shaped by a road with cars appliquéd and his name monogramed. So fun! 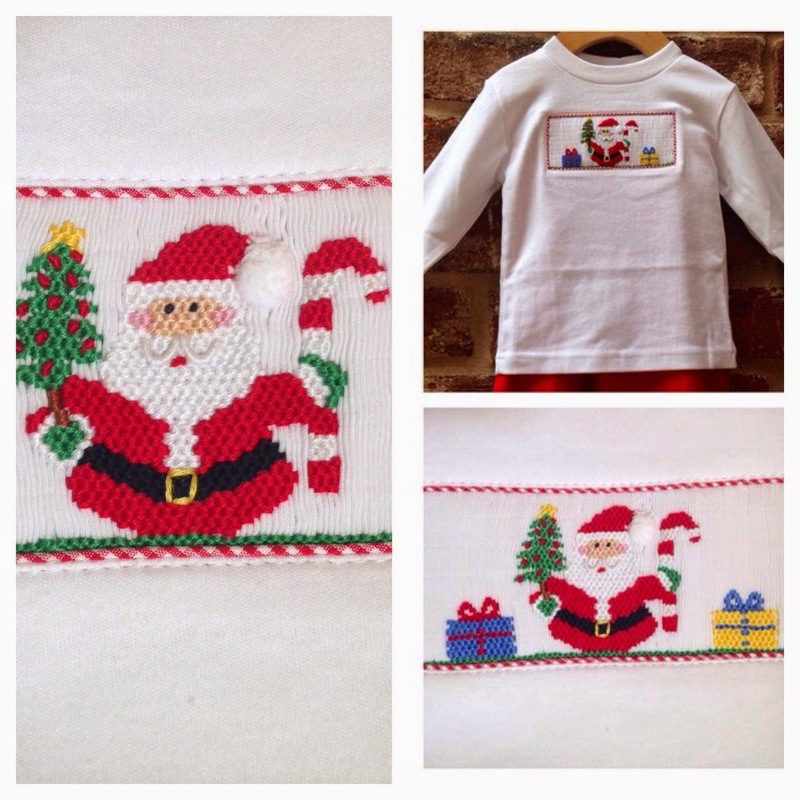 Gifts by Gita is a mother's and baby shop that has lots of cute shirts with lots of different themes to choose from. This is the shop where the birthday shirt came from. If you are looking for a unique baby gift for momma or baby, this would be a great resource! If I could go back, what would I keep and change? games aren't really successful and a lot of work. So, outdoor play was great especially at this time of year. I had a little too much food, but we didn't run out. I think I will scale back next year. We had the right mix of homemade items and bought items so I wasn't working so much. Themes can be as easy or difficult as one makes them. This was an easy one! Shopping online for gifts and party items is a must. Best decision ever! Lots of selection and allows me to pace the work load of it all. 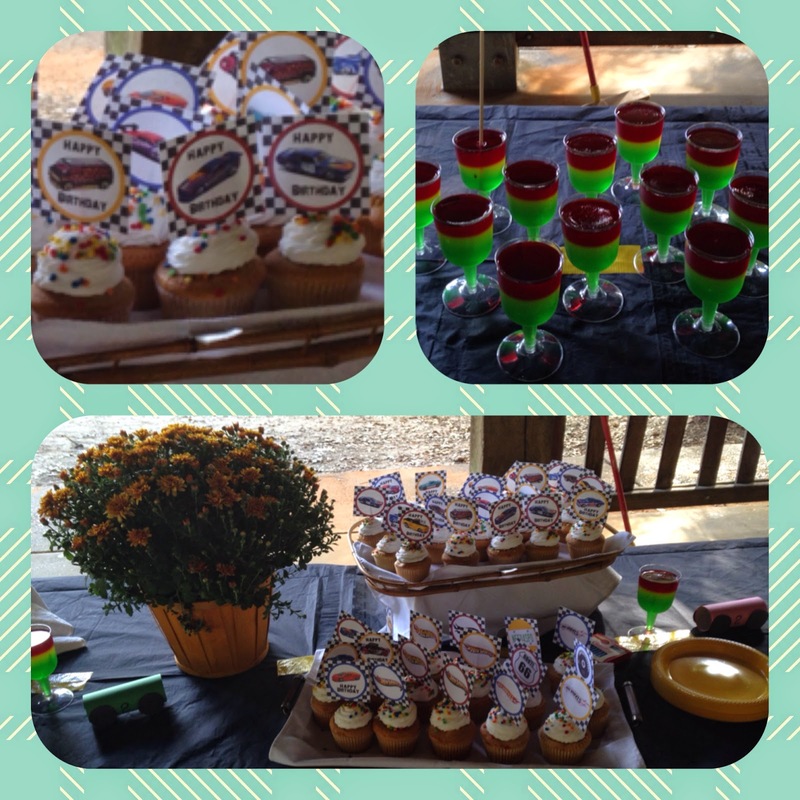 This birthday was a success and much easier than last year. I felt like I paced myself more and did less. But, it was still fun, cute and enjoyable. Yes, I did steal that off of your Facebook page! 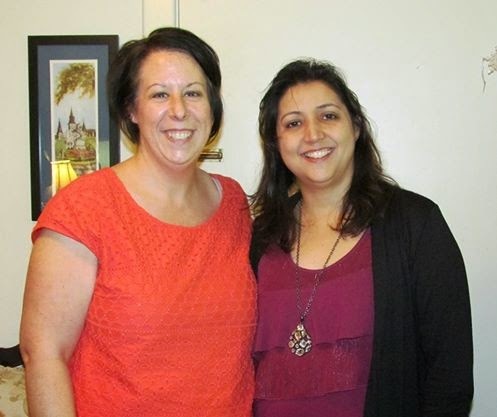 My friend Lee Ann and I have been friends for over 35 years. She is my longest friend! I can't say the word old in that sentence no matter how young she is! And today is her birthday. She still has the sense of humor that she did as a kid! Which is a very good thing! She's not crazy about television. No matter the time or distance, she will remain my dearest friend. We grew up in a small town in South Mississippi with less than 1,200 people and not even a stop light. We spent summer evenings walking and talking, swinging on their porch, having sleep overs and playing games. There were endless hours of laughing and silly jokes (ones we still laugh about)! Just a couple of years ago! Life in a small town meant that we entertained ourselves with the simple and uncomplicated. Some time around age 10, we created a little newspaper that we typed up and delivered to "old people". Each edition was typed on my mother's manual typewriter and ran off copies on an old mimeograph machine. I can still smell that cool, fresh purple ink. Lee Ann was a determined and confident child. Both traits that have carried her well through life. She wore corrector shoes that she hated, but she wore them no matter what. One year some boys in our class asked her if those were karate shoes. Her response, "Yep! You want me to kick you with them!?" She could turn nearly anything into a joke and would just keep going. Nothing ever seemed to bother her. 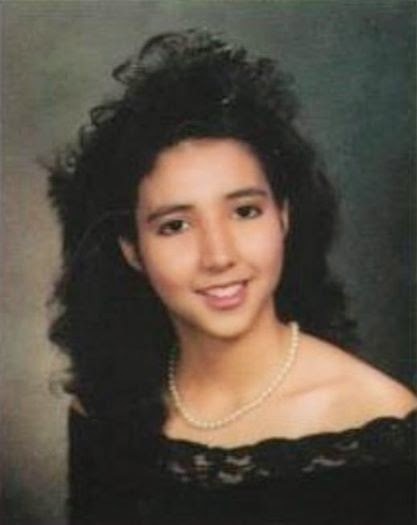 She hated wearing make up and curling her hair. 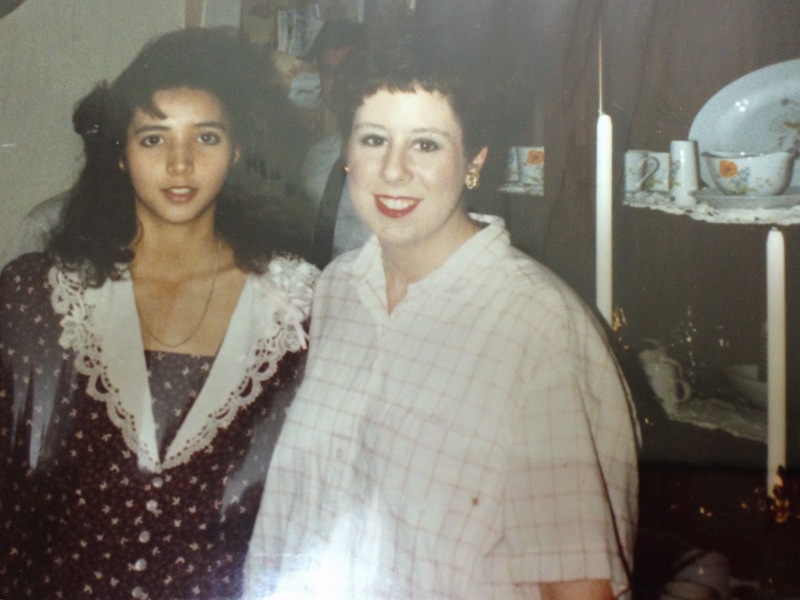 I can remember her coming over to our house after getting ready just so she could brush out her hair and wipe off her make up. I was still in a hairspray fog and painting my face. I never understood the point of wasting good make up and hair spray like that! Her argument was that it was easier just to appease her Granny, put on make up and do her hair. Then undo it all! Yes, Lee Ann will always remain one the most logical people that I have ever known. I suppose a lot of things have changed since the years of eating fudge pops on their screened in porch. And other things haven't. She still loves sweets and would feed her kids pie and candy for breakfast. Don't judge. You know you are wondering why your momma wouldn't do the same! I hope that Lee Ann's expectant daughter Lucie remembers that pie and candy for breakfast never hurt anyone. Make it a family tradition. Your mom did it with you, and you turned out great! And, it made you love your mother for all of the obvious reasons! She is awesome! Lee Ann worked for an accountant in Omaha when her children were small. Once, her boss gave her children each some candy and gave them strict instructions not to tell their mom. Both girls quickly asked, "Why not? She lets us eat candy all the time!" For any overly zealous mother or person in general reading this, stop before calling department of human services on Lee Ann! Her youngest daughter just finished another half marathon. I am starting motherhood, and she is becoming a grandmother this year. Yep. I did just say that. And I'm not calling her the "O" word. I guess that just anchors the endless times I answer the question of if I am King Diaper's grandmother. We laughed about that very thing when she announced her daughter's pregnancy. Tonight as I sent her a snap chat of Joseph and I telling her goodnight, I thought about her sending pictures of she and her new grand baby soon! I can't wait. I enjoyed watching her girls grow into beautiful young ladies. And, now I'll have the opportunity to watch her grandchildren grow too. While we live miles apart and see each other on rare occasions these days, we still keep in touch with each other often. We snap chat silly pictures. We text. And, there is always Facebook. She never answers her phone, but is probably busier that I am at this point in her life. Apparently grown up kids and cats are a lot of work. I'm not judging. I think it is true and ahead of me! Hopefully not the cat part. She tells her girls stories about us eating raisinettes in church and our root beer and powdered doughnuts at sleep overs. I'm not sure if she has disclosed the fact that we tried to pass off Tums as Sweet Tarts to someone once to make them stop eating our candy. As I previously disclosed, we grew up in a small town and had to entertain ourselves. We went to church camp in the summer and mission trips to New Mexico. There has been big hair and big drama along the way. But what remains is that endless friendship that I cannot imagine life without. I hope that King Diaper will make life long friends like this. Reflecting on our friendship makes me sad that she lives so far away. Even if her kids are grown up, he could enjoy playing with her grandkids! (or cats) And she could give me lots of parenting advice. I mean she's about to be a grandmother and all. Isn't that what they do? So as I finish this up, I think its time for me to call, text or something for her birthday. It is her birthday after all. And maybe I'll have some cake in her honor! Or I could just feed it to Joseph! Happy birthday Lee Ann! Guess what? Love you! I couldn't imagine what life would have been like without you! As we prepared for and anticipated the birth of King Diaper, there was always a part of me that was sad that our child would not know my father. He was a huge part of my life, and I still think about him daily. Early on, we decided that we would name our child after my dad if the baby was a boy. And, as fate would have it, we had a boy with my father's namesake. Daddy was a very practical person that took pride in hard work. He was a strong man and instilled his work ethic and faith in both of his daughters. Many of my childhood memories involve fishing, playing kickball and family vacations out west. We were involved in church activities as he was a pastor of a church. And this was the center of our lives. His favorite color was blue. And even though he was a minister and often wore a suit or dress pants and button down shirts, Daddy preferred his work clothes. He called his jeans dungarees. When I think about daddy now, I picture him in his dungarees and soft faded work shirts. I saved a few of Daddy's shirts. This collection included a few of work shirts and a Sunday button down. And, yes, surprisingly (or maybe not so much) they were all blue or some variation. I never really knew what I would do with them at the time that I stashed them away. King Diaper was not even a thought at that time. But, when I started to prepare for our new arrival, I decided that I would like to use those shirts for a quilt. I think Daddy would have liked that. He was practical that way. My mom has been helping me with this project. I cut up the shirts into squares. 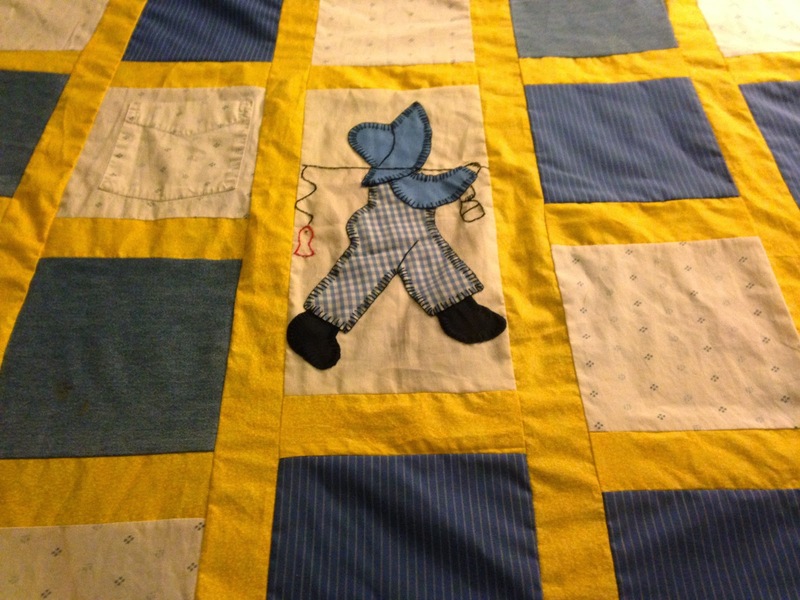 She has made the quilt top by piecing them together and placing a little Dutch boy square in the middle. We are going to have someone to do the quilting on a machine to finish the project. King Diaper will have a quilt with a little piece of his grandfather. It has been both a hard and happy project. But, I'm glad we have taken on this task. It seemed wasteful and against everything Daddy was about to just have those shirts hanging in a closet or stuffed in a drawer. And as a child of the Depression where nothing was wasted, I think this quilt is everything he was. 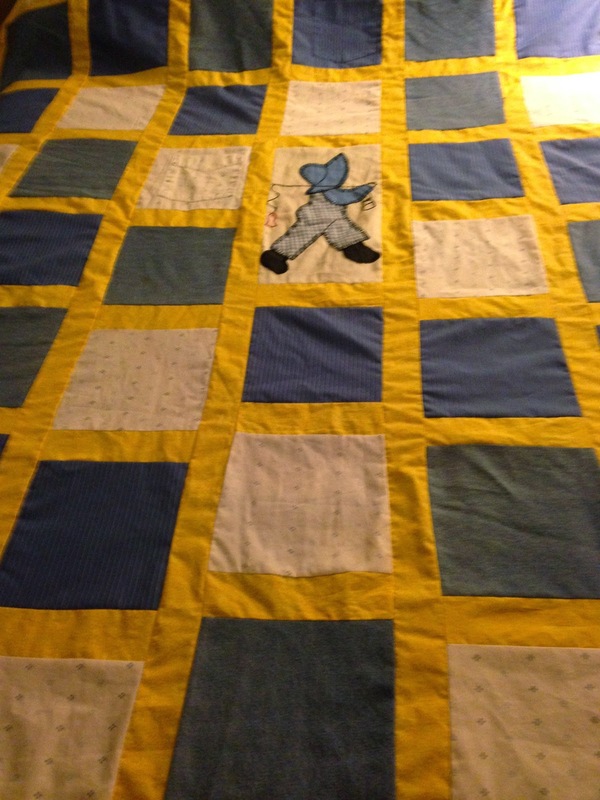 With daddy's favorite color and mixture of work shirts and dress shirts, this quilt is a happy memory of the things that I remember best and most about him. And what better way to remember and honor the man that we loved in our life. I would like to think that if we still had daddy, he would marvel at the miracle King Diaper is. He would enjoy taking him fishing, telling him stories and taking him on walks outside in the yard and talking to him about the pine cones. (King Diaper's favorite thing at this point!) This quilt has forced me to think about these things that make me both smile and cry at the same time. But, its a good thing. Use some of the things that you have from childhood, a loved one or special time in your life to make a memory quilt, shadow box or other memento that will allow you to keep your memories alive. You will be glad you did - even if there are a few tears along the way. Tears are the seasoning of life. Things would be flat without them. Celebrate life big and often. Its how I like to live best! Have a great week! Meeting my goal for steps is great! Jawbone became an obsession of mine over a year ago. I bought myself the original UP band for my 40th birthday when I was trying to get back in shape after King Diaper's arrival. I described my mood at that point as "forty, fat and frumpy". Not how I wanted to start out this new decade in my life. 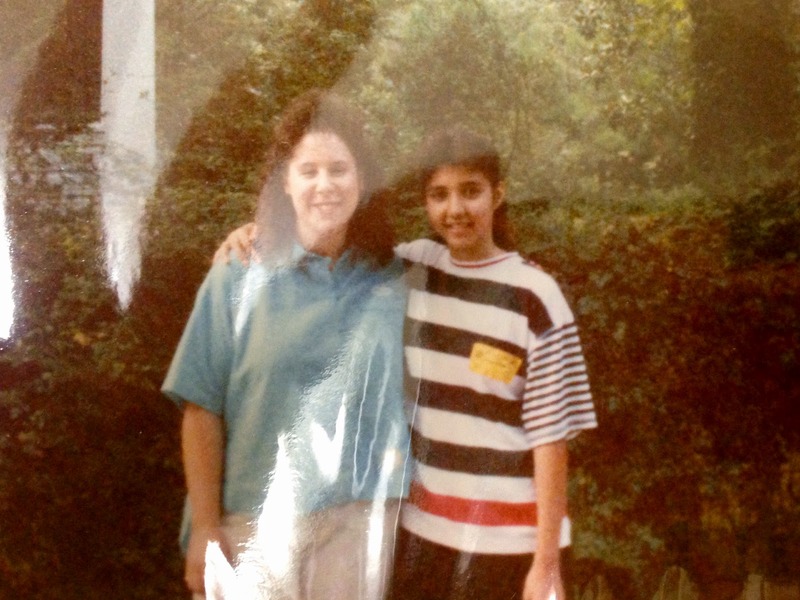 Taking charge was a big thing for me to get back to where I was pre-baby. The new Jawbone 24 continues to deliver, but it has some added features that I really love! 1. It syncs with my iPhone app through a bluetooth connection. So much easier than plugging into my headphone jack to sync. Just open the app on your phone, and sync up automatically! 2. It continues to work with other apps that you may already use like My Fitness Pal or Map My Ride. If you are using these apps to track workouts or food, they will sync with Jawbone. 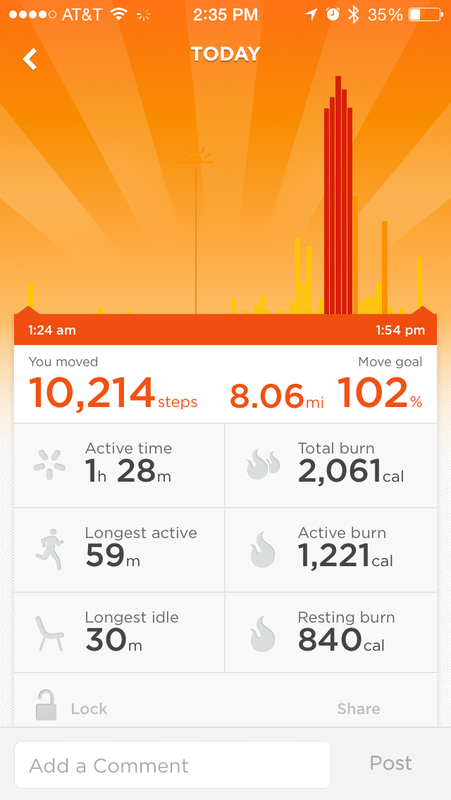 Its an easy way to monitor daily activities to track overall health and activities. 3. Finally, my new favorite feature is the food rating system! granola and milk - not so high up! 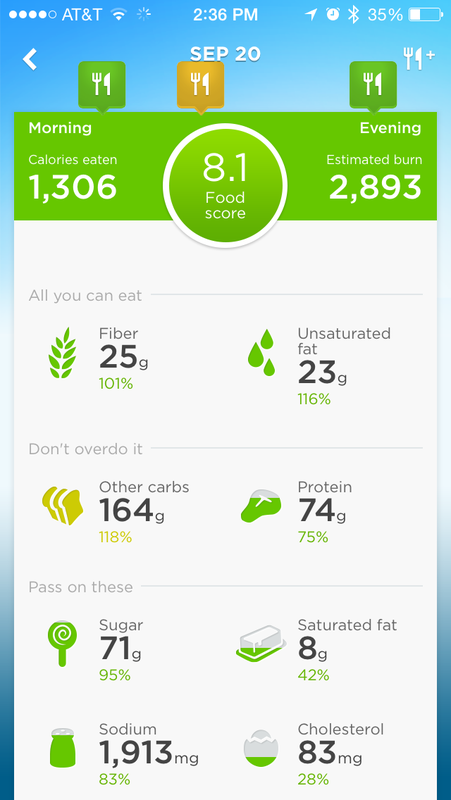 The user can add food into the daily food diary directly through Jawbone or with My Fitness Pal or other apps that are similar. 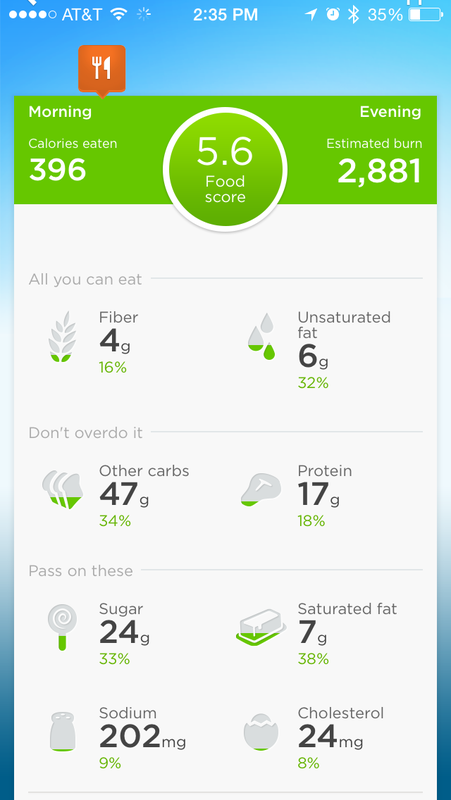 Jawbone will analyze the food per meal or snack and give a 1 - 10 rating based on fat, salt, sugar, etc. This has been eye opening for me. Lots of things that I would think are great, healthy choices don't rate so high. And other things that I haven't thought much of are rated great! The goal is to keep food in the "green" higher categories as much as possible. Its a visual way to think about food and how to make better choices each day! Each day there are food, exercise and lifestyle tips. The band can track sleep and determine how much rest you should be getting based on what you are getting. Its the total package! I love that I can really see what my overall daily food rating is each day. If I don't eat so great at one meal, it encourages me to do better at the next. And, I can see how I am doing in individual categories for fiber, fat, carbs, etc. Seeing the actual numbers and how they correlate per meal and over the course of the day is a big deal for me. I really like this feature. So, if you are looking for something to motivate you each day and keep you on track. This is a great product for you. You can even set up a bedtime reminder to help you get more rest and sleep each night. Getting back into shape and living a healthy life isn't always easy. But, this is a tool to help you take a closer look at your level of activity, rest and quality of food. These three things play a huge role in overall health. I feel like I make better choices and hopefully will be back to where I want to be sometime soon. I feel like I'm making the right choices and and in the right direction! Bluum Box Continues to Deliver! First, books are a big hit in our house. As we approach potty training at our house, this book will come in handy. However, I will be the first to say that I think that these kind of books gross me out! Practical items such as shampoo are always a winner for us too. Tokyo Baby USA is a great product line of "baby and me" items. This is something that I probably would not have sought out, but I'm excited about using it and is something that we actually need! Also, bath time is a big deal too. I look forward to being home and being able to give baths and participate in some of the things I miss out on during the week. So, this kind of fun item is something that gives us something to do together. Plus, King Diaper loves music. A whistle is right up his alley - and a stab at my sanity I'm sure at the end of a long day. Each month there is a "mommy" item in the box. This month is was a bag of dried peas for snacking. Also a big hit! I'm really working on getting back into shape. Healthy snacks and treats are always welcomed! Is it worth the money? I think so. Boxes are approximately $20 each month depending on the length of subscription/commitment. This month, there was approximately $39.87 in products plus tax. So, basically I received these items for about half off! Totally worth it to me. If you want to try it. Use the link below to save on the first month! The box will come to your door, and you can always login to your account to update milestones your child is hitting. This will further customize the monthly box. 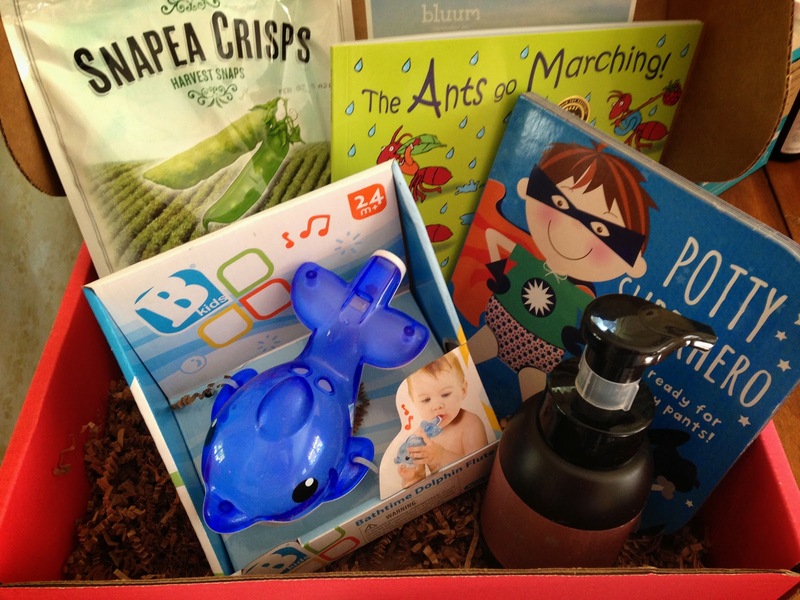 This type of service also makes a great gift for a child. Its like getting a gift every month. It can be done for one month or more. Great for family that lives far away or that you are unsure what to buy! Check it out. This has been something that we look forward to each month in our home. I'm sure you would love it too. Overwhelmed is one word that describes me on most days. This isn't related to work or my travel schedule. I'm pretty sure that I'm not the only mother to ever feel this way and am not professing anything new really. Let me preface everything that I'm about to say with the fact that I am thankful and grateful for my overwhelming life. And now, you wonder, what I even have to say if I'm grateful. 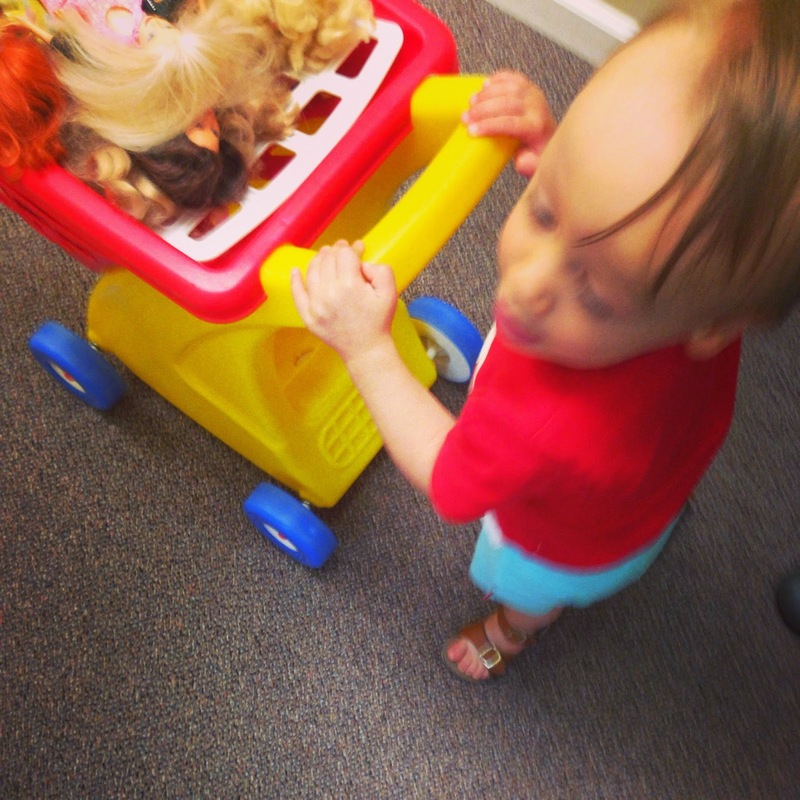 King Diaper goes to speech and physical therapy every week. And our main mode of conversing at this point is a lot of screaming and grunting. Sure, there are a few words, but more screaming. Pretty normal for the most part of a two year old. But throw in the fact that the speech therapist is recommending sign language and games to encourage words, and it does become overwhelming. This past week, while on the road, I got a text from my mother telling me that the speech therapist says his is trying to imitate words and sign language. Since I'm not able to go to speech therapy with him each week, I don't know what words they are signing and how to even sign them. I have managed to locate some starter signs for basic things. When we are eating, getting a bath, and having story time at the end of the day - it gets lost in the shuffle. Yes, I'm trying to do all of these things, but my mind is stuffed. At this point I know more medical terms and jargon related to his prematurity, chronic lung, and pulmonary hypertension than I ever thought possible. Now, I'm trying to sign while trying to survive a screaming toddler. And maybe this isn't so different from every other mother out there. Most mothers are all overwhelmed on some level. The cause for that emotion is just different and dictated by the individual child. Parenthood has made me really rethink students and parents from my teaching career. I can remember that glazed over look during parent conferences. I would be standing there recommending activities to help their child. As a young teacher with no children, I couldn't figure out why they all had that look! I know now! Its a lot to take in! Sure we do all of the normal things at home - singing, reading, talking to our son, playing outside and all the rest of it. Yes, I do try to incorporate things from therapy into our daily routine, but it is more difficult than it would seem. I'll keep trying, but admitting that it is overwhelming is a way for me to keep my sanity at this point. And I'm okay with that. By the way, in case you want to know how to sign the word "more". Drop by my house, or hop on Skype with us. It is "more snack", "more books", "more songs", more, more more. He signs the word more emphatically for anything he might want. The word "Bye" is a daily favorite. I will take that as progress. He can actually say "bye" verbally. He may say it when someone comes to our front door. It is interchangeable with hello, and it is his way of shooing you out the door too! It is also his way of coming to terms that he is about to leave something, so "bye" to pine cones or "bye" to the dog that we are passing by on our walk. I'm okay with being overwhelmed. However, I hope that this year I will start to be less overwhelmed and more into a comfortable routine. Or is that just wishful thinking on my part? I have no idea how to answer that. Maybe I need to just strive to become comfortable with the overwhelming. From our house to yours, "More" and "Bye"! We love books at our house. I can't tell you how many times I've read Good Night Moon or Chicka Chicka Boom Boom. And we are gonna keep on reading. I'll have them memorized sooner or later. It is the best part of my day. Recently, I came across an ad for Pint Sized Productions. Anyone can create a child's board book with simple pictures by inserting them into a template. I did one for King Diaper's birthday in about 30 minutes. First, select the theme or template for the book. These themes are simple and can be customized with pictures that you take on your phone or camera. If you are really creative and tech savvy, you can create everything from scratch including the artwork using downloadable blank templates. This is something that will require a bit more time, but can also yield and excellent project! Next, you will insert the pictures into each page of the book. With each addition, you can preview the pages and edit as needed. I would recommend making sure that you have edited you photos ahead of time to ensure the best quality book once you are finished. After you have approved the final product, you will order and pay. It only takes about a week to get your completed book back. Books are sturdy and durable. They make great gifts for any children in your life. And, if you want, you could even give a simple gift certificate for someone to make their own book! You can even make a set of personalized flash cards to use with your child. Both books and flashcards are great for building vocabulary and teaching your child valuable language skills. You could even make your flashcards with simple family member and pet photos with the names on each one. This is a great pre-reading skill. 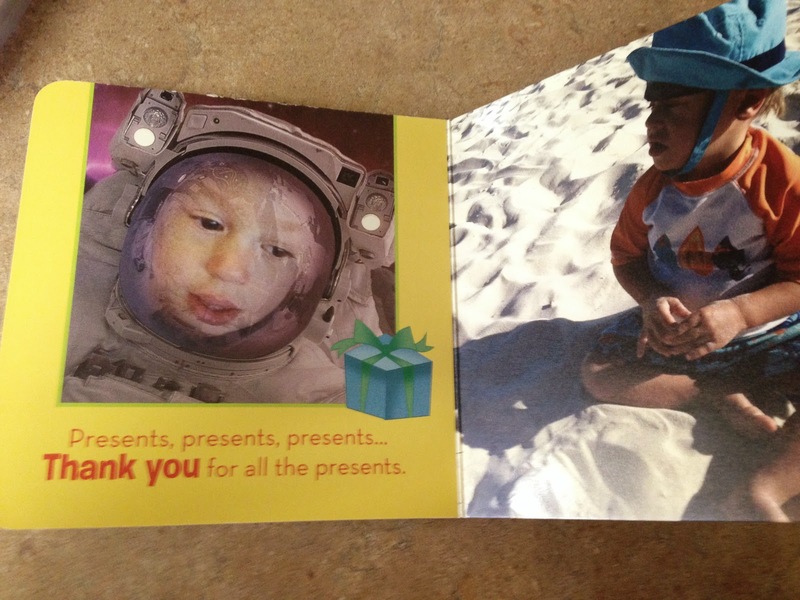 As you move into the holiday season, consider giving a child you love a book of his/her very own. 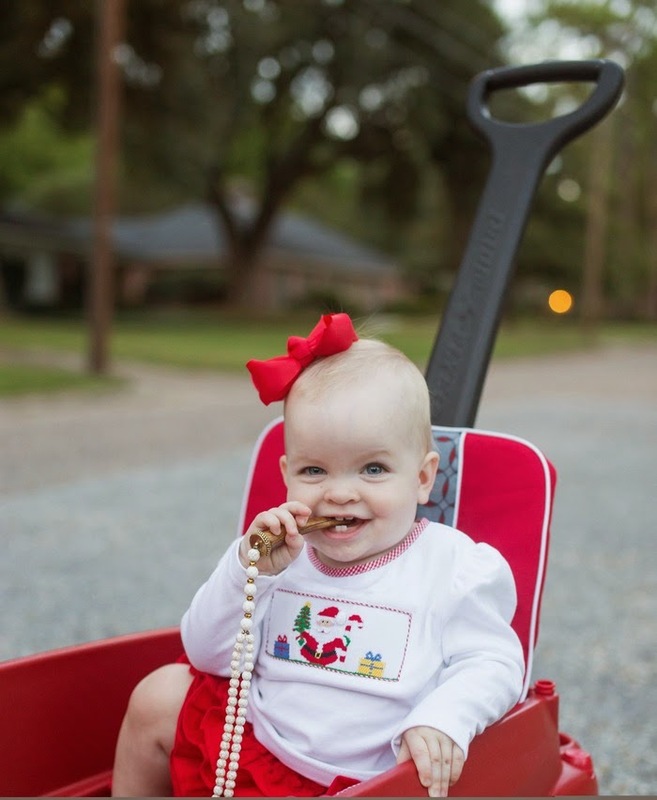 One with personal pictures can be very exciting and entertaining to your child. Plus, you will enjoy making the book as much as you will reading it with your child. And what is more fun than that? King Diaper loves pointing at the pictures and saying "momma" and "daddy" and some words we can't understand for Bunnie. He also enjoys pointing to the stars and saying "star" on one of the pages. I had really hoped that this would be the outcome at the time of making this. As we are working on language, this is a fun and natural way to learn to say family member names. Happy reading, gifting and making memories with someone special in your life! If you have a favorite book or gift idea for a child, feel free to share in the comments section. I love feedback from readers. Lambs in Ivy - A Seasonal Preview of Social Shopping at its Best! For a busy mother, shopping isn't always easy, fun or convenient. Welcome to the world of social media shopping - where you can shop when it works for you. On your phone, tablet or computer, you determine when and where to shop! Could it get any easier? Oh, and did I mention monogramming and free shipping??? Lambs In Ivy has become a favorite in my house for lots of reasons. All of the pictures featured on today's post are from fall/winter clothing items that you can find now! Below are some appealing shop factors that you may or may not know. Quality clothes that wash and wear great! Lots of basics for every day. Church and dressy clothes too! Monogramming is only $12 extra. They offer bows for girls that coordinate with fun outfits. Big selection of clothing for both boys and girls. 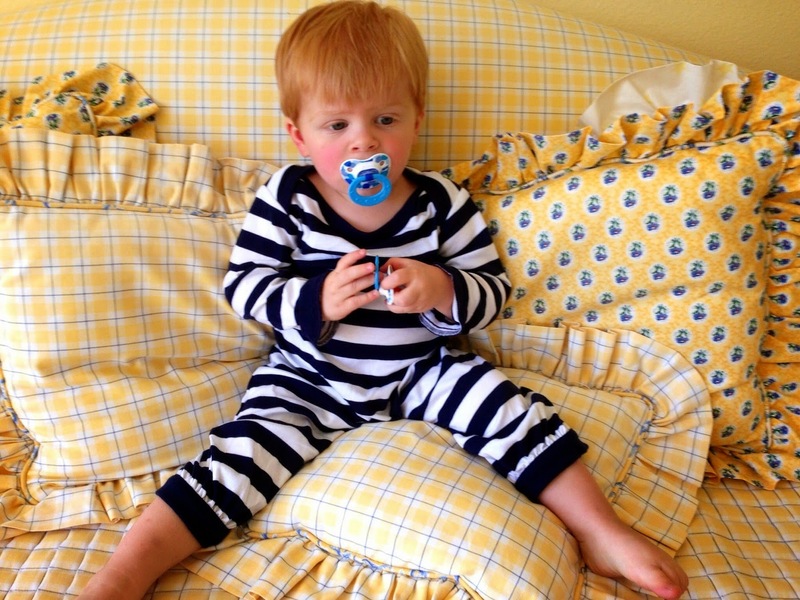 Coordinating outfits for boys and girls are available in many options. First, follow them on Facebook (Lambs In Ivy Children's Auctions) and Instagram (@lambsinivy). Whenever a sale or auction is going on, you will see it in your feed as you scroll through. You can comment on items that you want by size and/or email address. They will send you an invoice through soldsie. Pay up and you are done! If you want monogramming on any purchased item, this can be added and check out. If you have questions about outfits, add comments with your questions. They will answer and quickly too! Communication has been a big plus for me with social media shopping. You can shop with certainty that it will be correct and they will try and help you make good decisions about sizing and monogramming. Once you discover the ease of shopping through social media, you won't look back. It has simplified my life. I'm able to pick up things for the new season or holiday without having to physically go to stores and make the selection and hope for sizing. 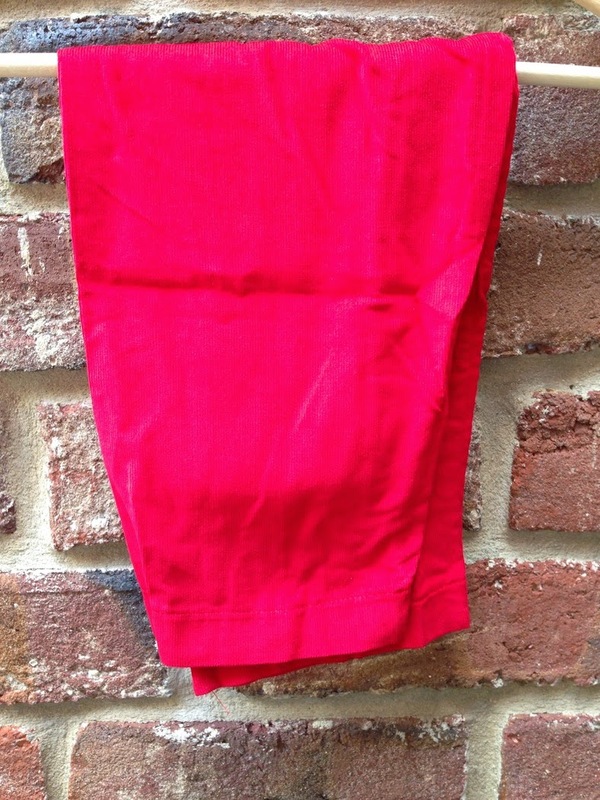 Social media shopping allows you to see if your size is available and move on to something else if it isn't. Lambs in Ivy make great gifts options too. This is an easy way to shop for shower gifts, birthdays, and more. You can easily shop for any child in your life. It is not to early or late to be thinking about fall and winter pieces. This is a great time to think about outfits for holiday pictures and more. That time is right around the corner! 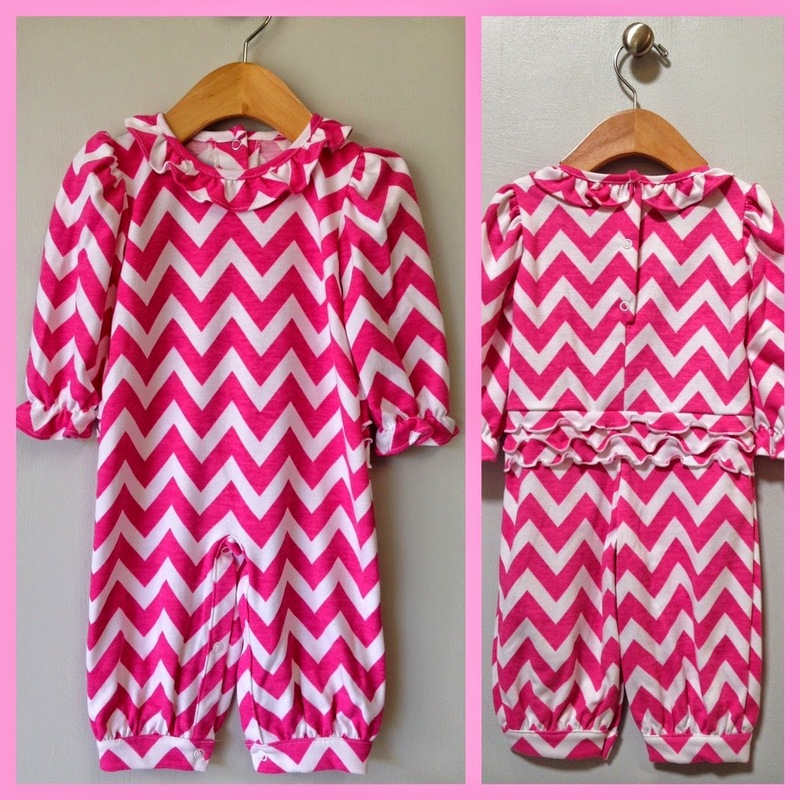 Chevron print dresses and little girl outfits. 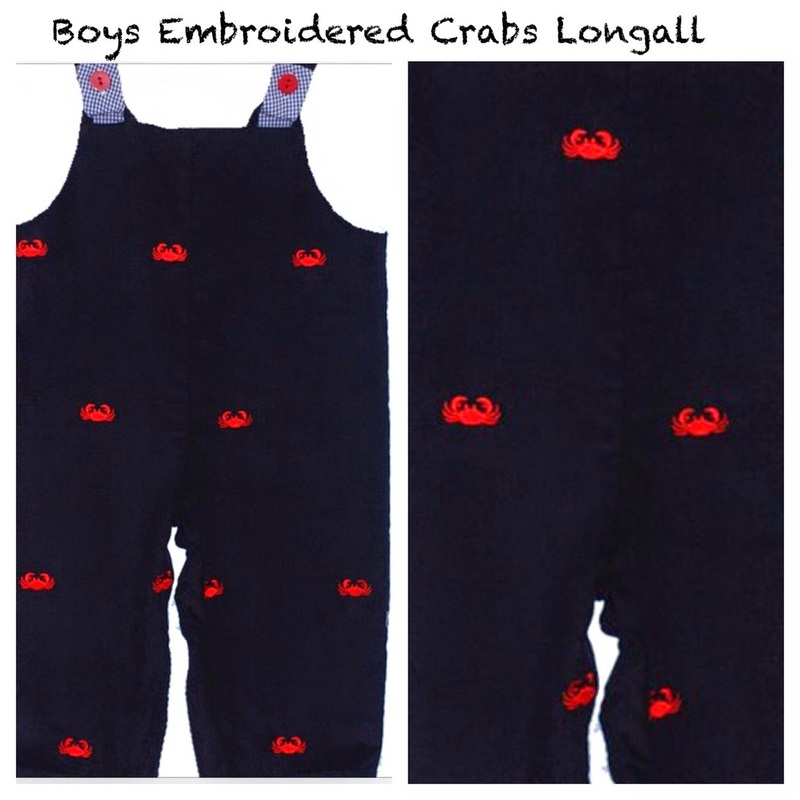 Bright colored corduroy long alls and pants for boys. Both the chevron and corduroy could easily coordinate for holiday pictures that have a little pizzaz and are different. Dresses and boys outfits in coordinating colors that can be mixed and matched for both fall and winter holidays. 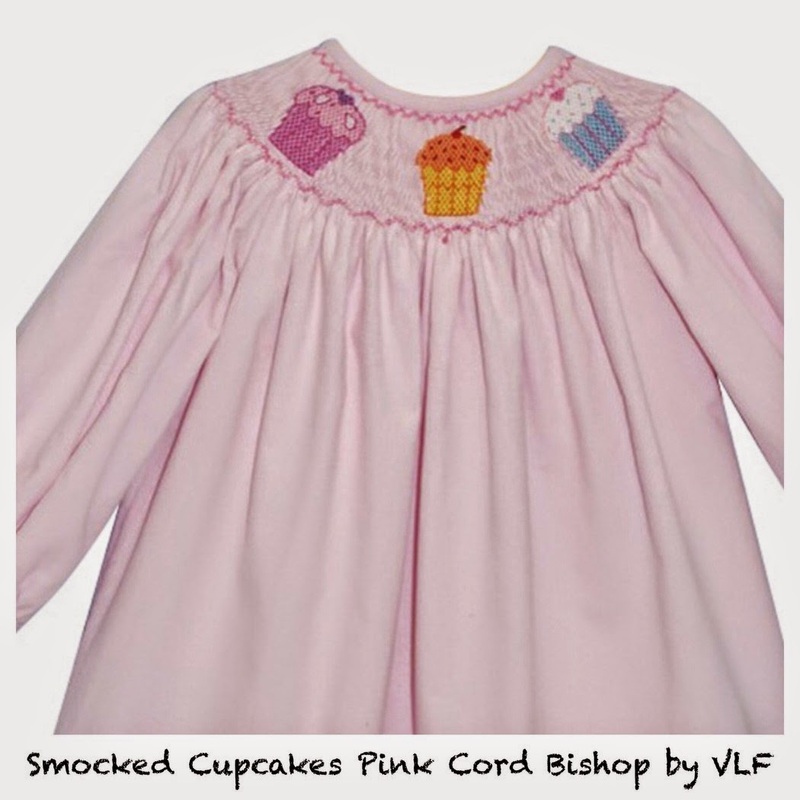 Select matching outfits for children in a variety of sizes and gender for multiple children. If you are a more conservative shopper but want to incorporate holiday colors the chevron print outfits and corduroy are great ways to take clothing across multiple holidays. The Lambs in Ivy Basics line has lots to choose from that are both practical and well made. Monograming makes these items extra special and is a fun touch. 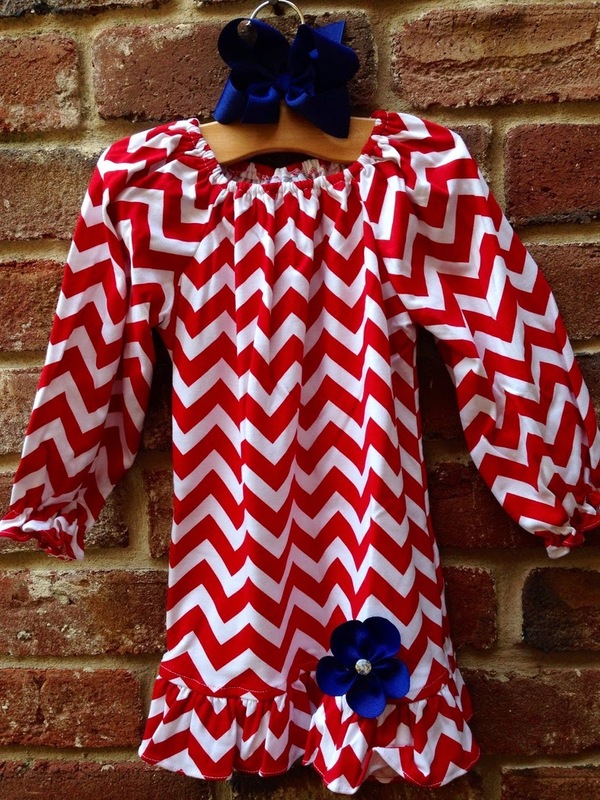 These can be cute play clothes and work well for day care too. Watch for sales and special events in the upcoming days to help save extra money. However, you are going to find that items are a steal even if there isn't a special sale going on. Lambs in Ivy makes it feel like every day is a sale! 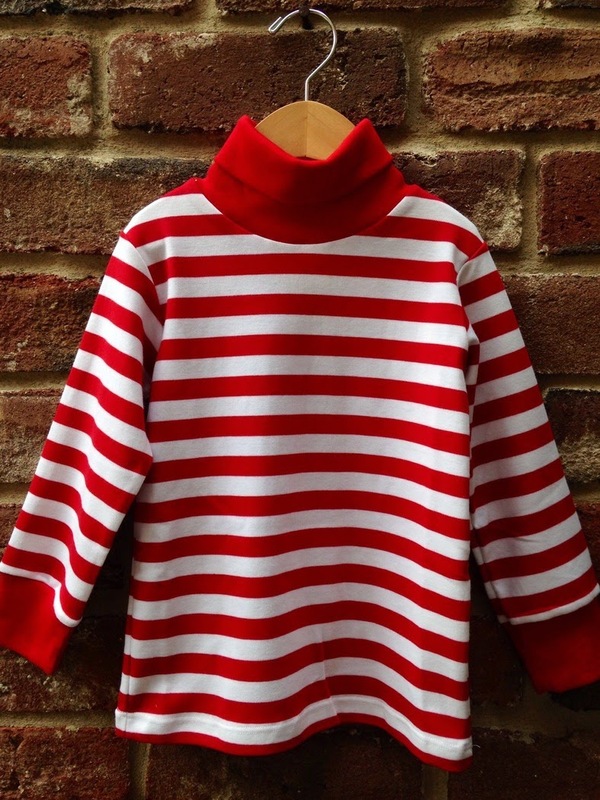 I think that these are some of the best priced kids clothes out there. The quality and service is great! Check them out online. Follow them on social media and shop away. It is easy, affordable and quality shopping right at your fingertips.